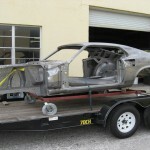 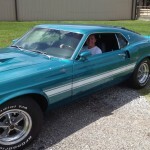 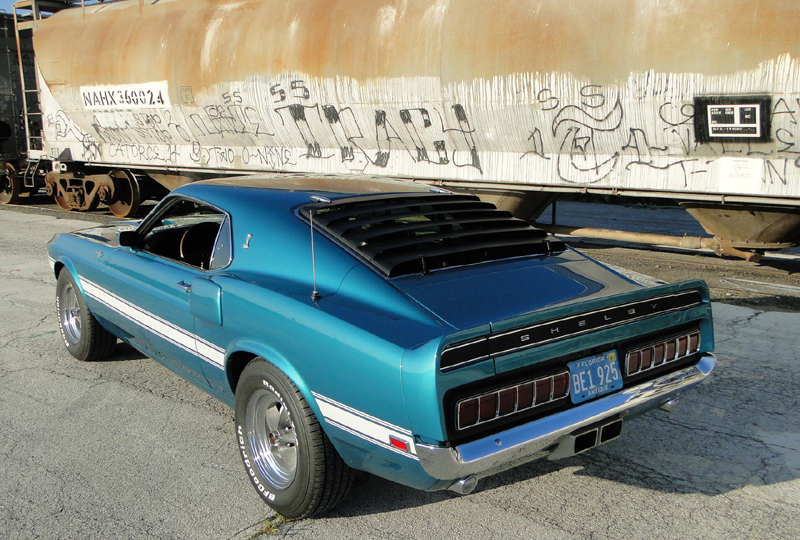 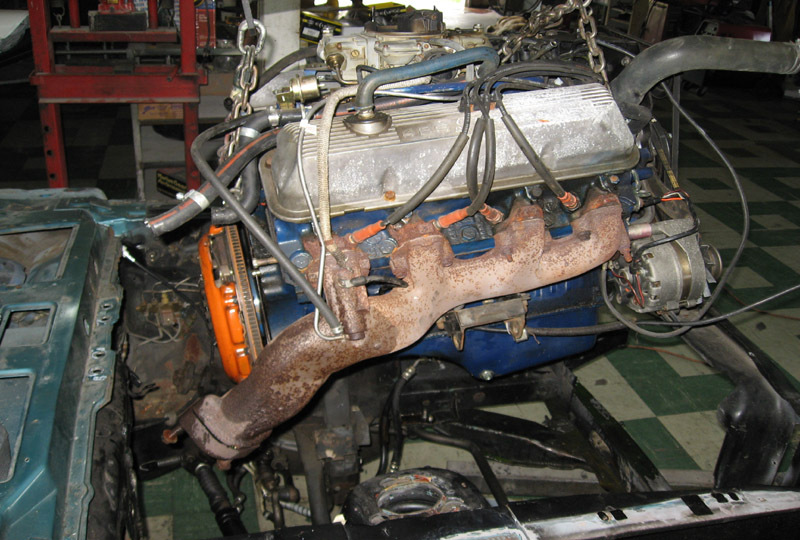 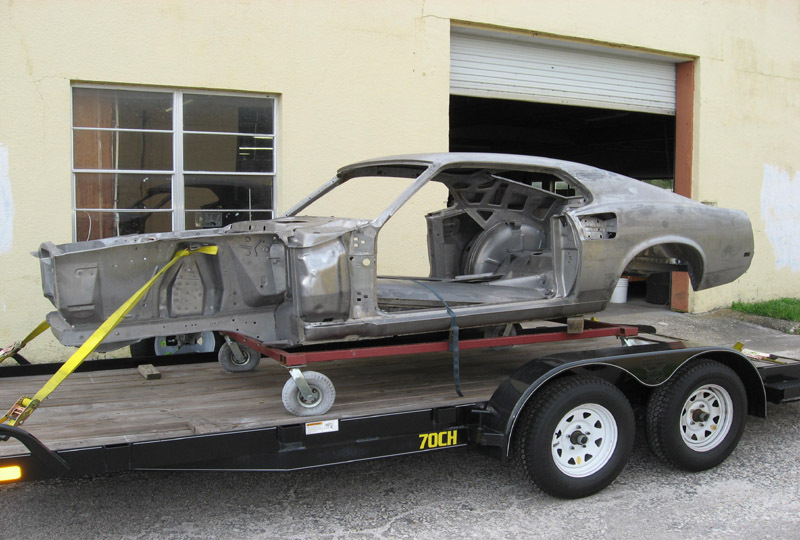 This 1969 Shelby GT500 will receive a complete restoration. 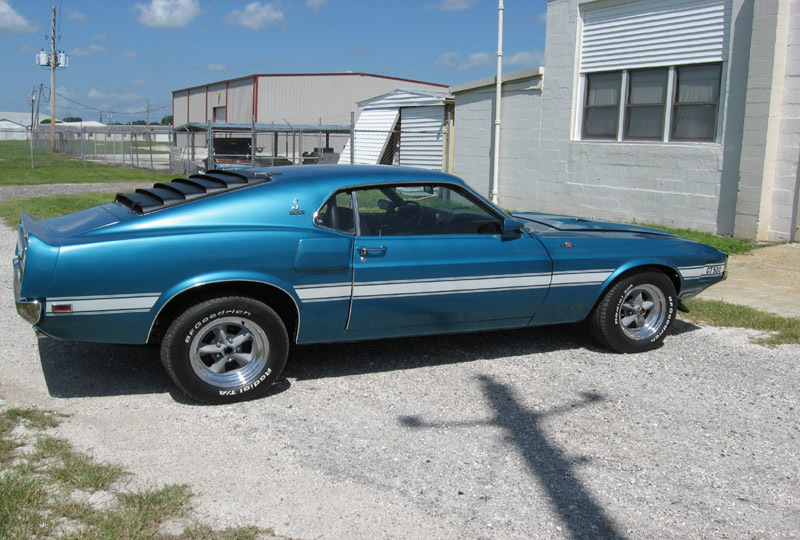 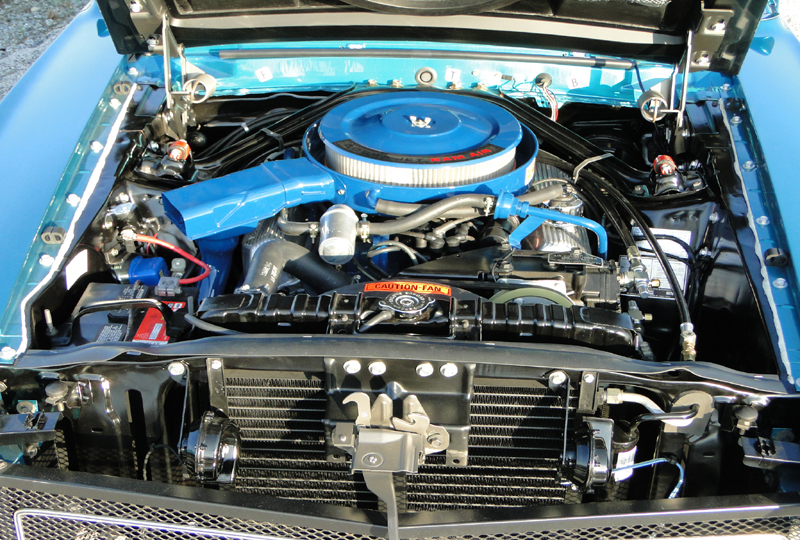 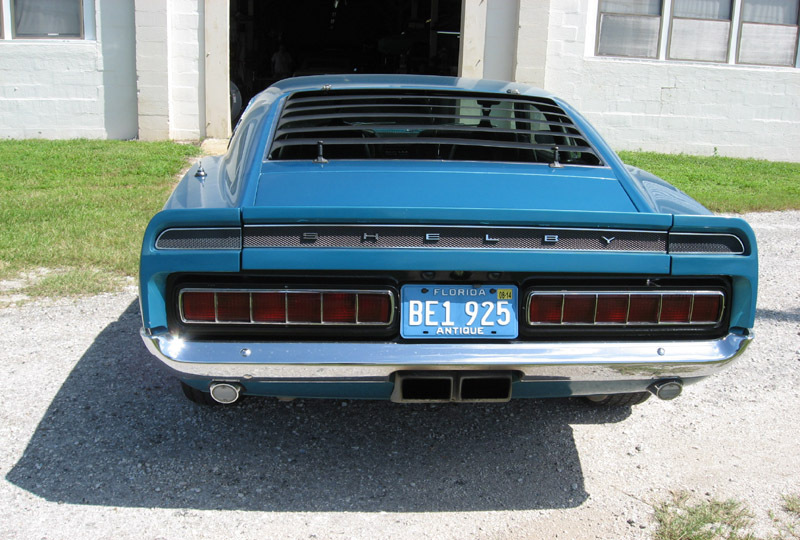 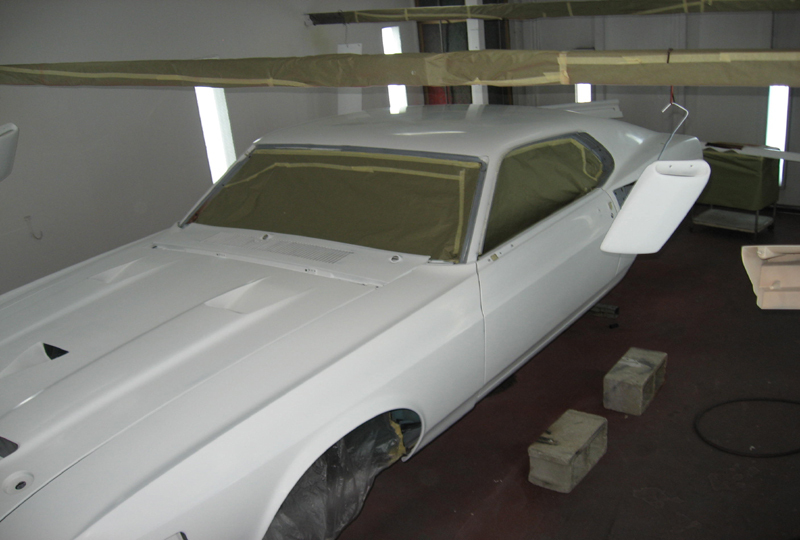 The owner saw the 1968 Shelby GT500KR that we had completed, which can be seen in our “Driveway Dreams” pages, at a car event and felt that his Shelby also deserved the detailed work and quality exterior paint. 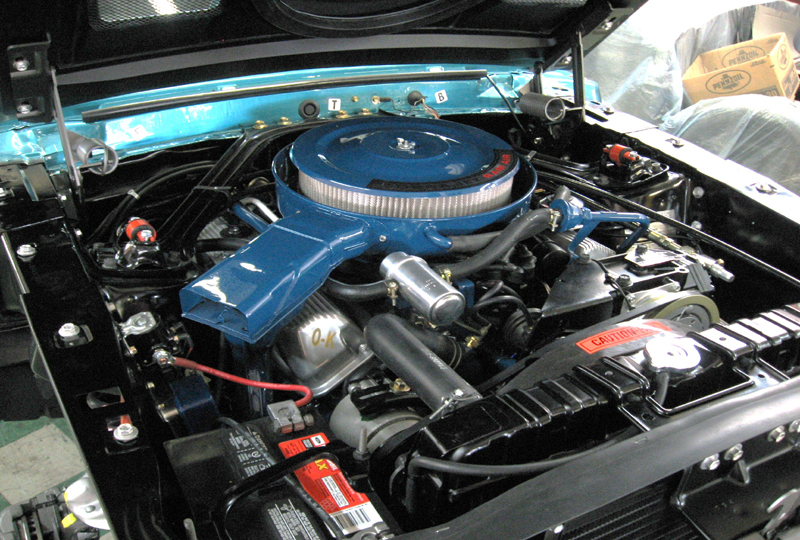 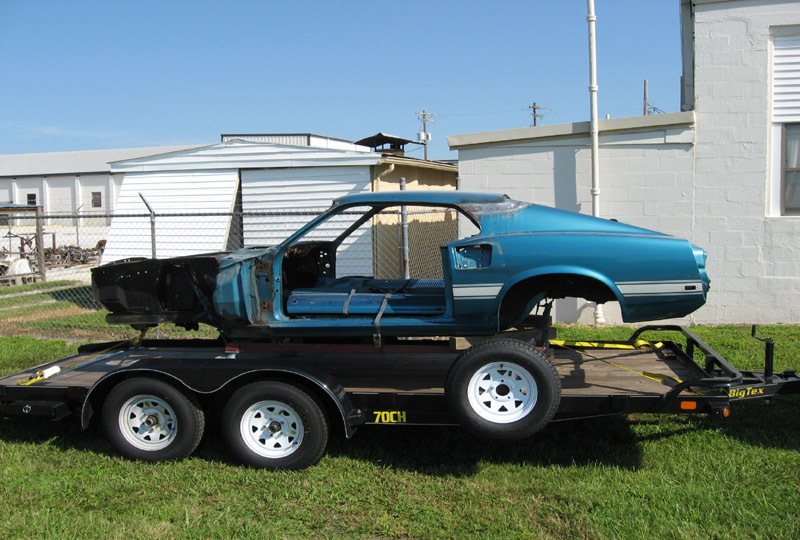 This car is equipped with the 428CJ engine, 4spd top loader transmission, 3.50 to 1 locker rear axle, power steering, power brakes, tip a-way steering wheel feature and AC. 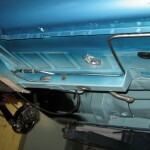 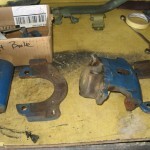 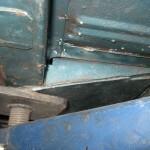 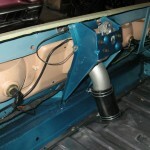 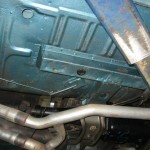 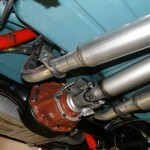 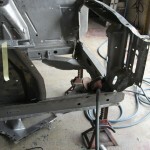 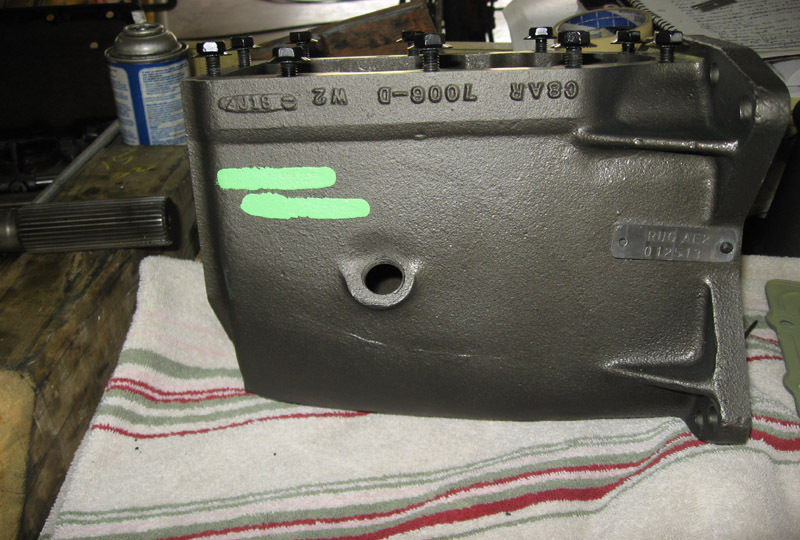 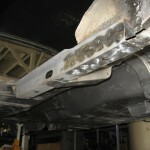 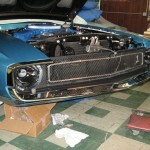 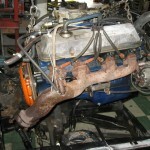 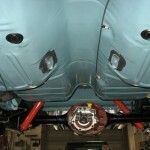 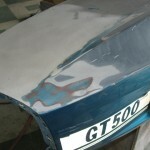 The following pictures show the 1969 Shelby project is well underway. 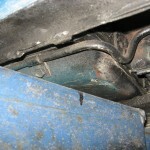 The first section of pictures shows some of the details that we strive to find. 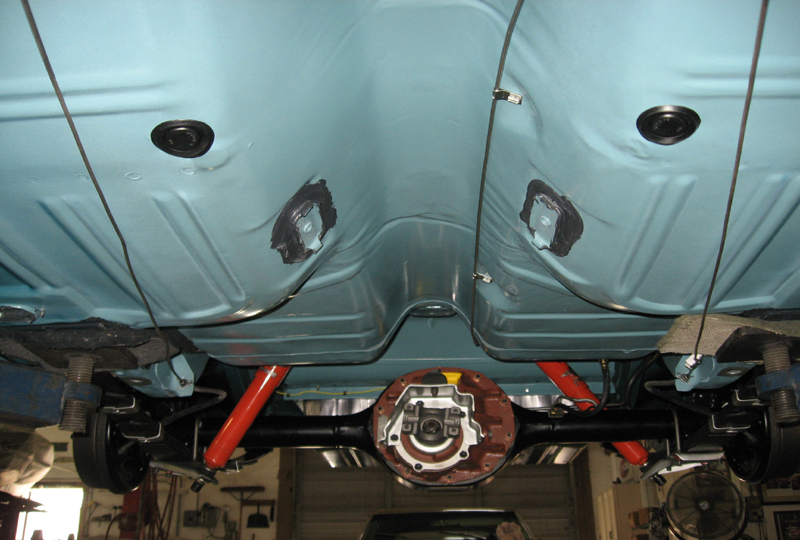 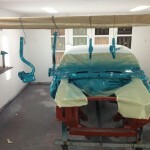 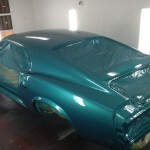 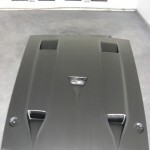 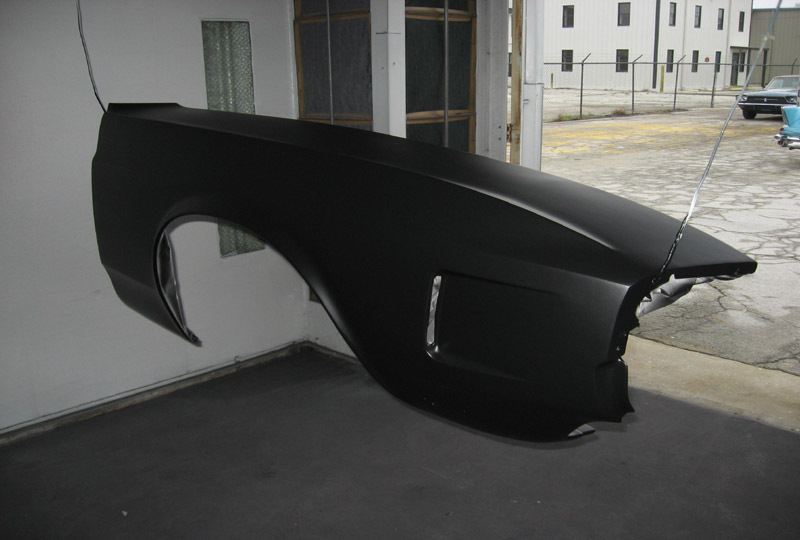 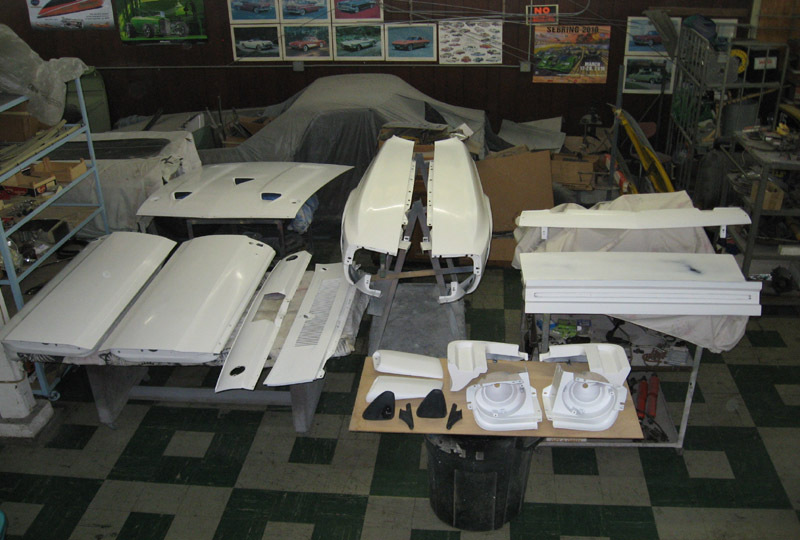 Belly color or primer, layers of overspray or masked off areas, original paint hidden for proper color match. 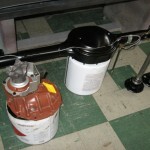 We looked up the original paint code and then compared the color to the original under the data tag. 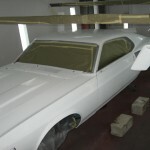 Many of the pictures below are the before shots with the after shots to follow as the project move to completion. 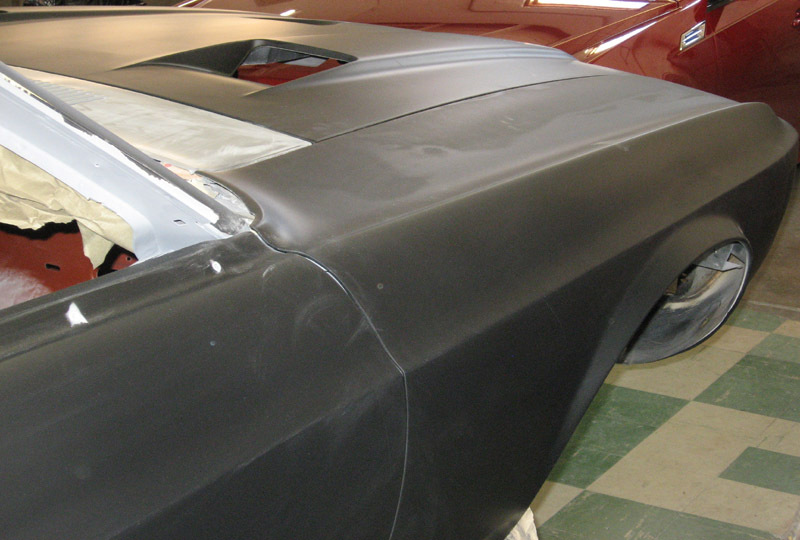 The body panels show hidden details we strive to recreate on the final finish. 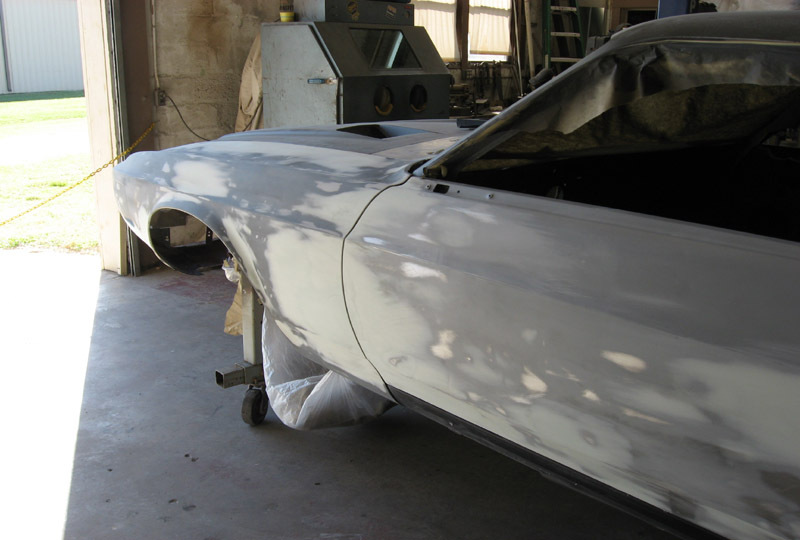 The original paint was on the car just buried under several layers of touch-ups over the years. 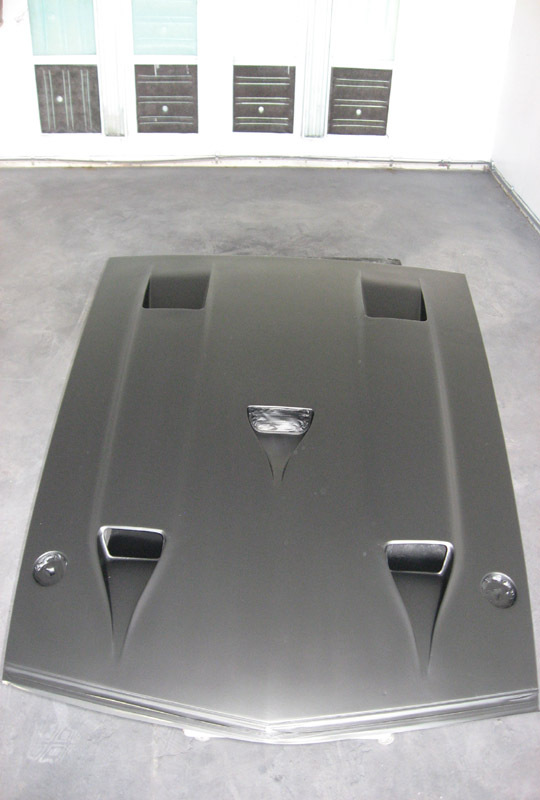 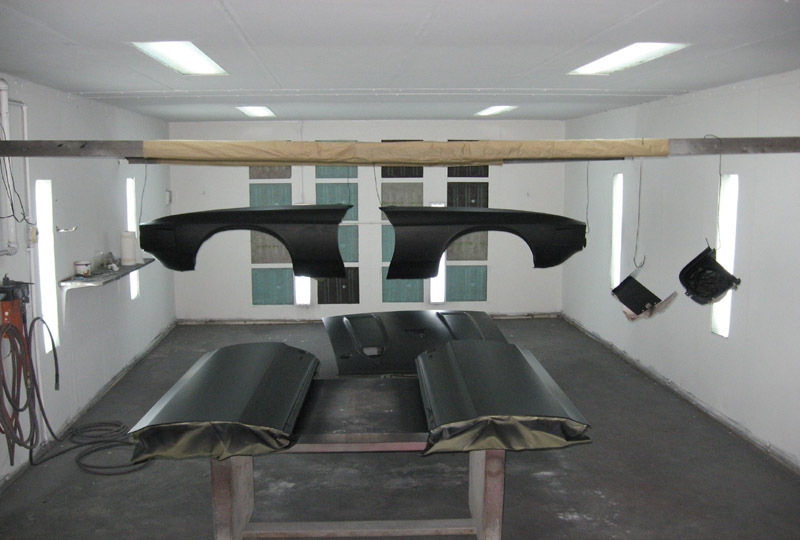 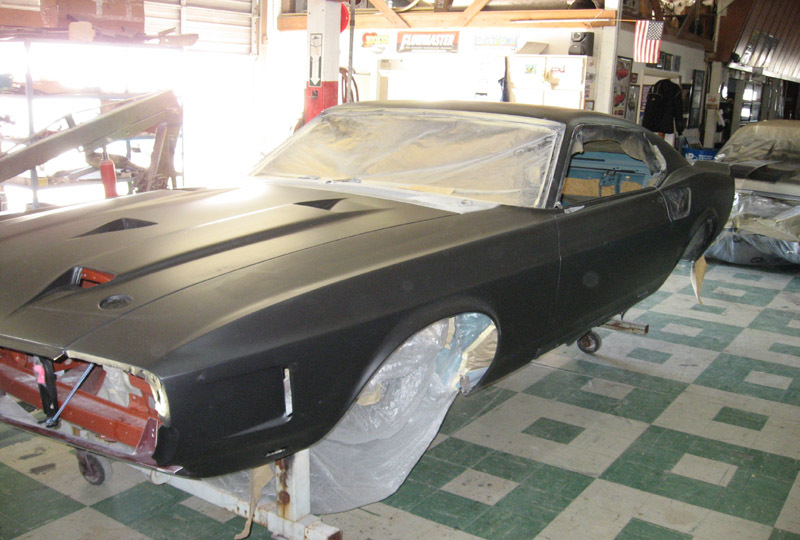 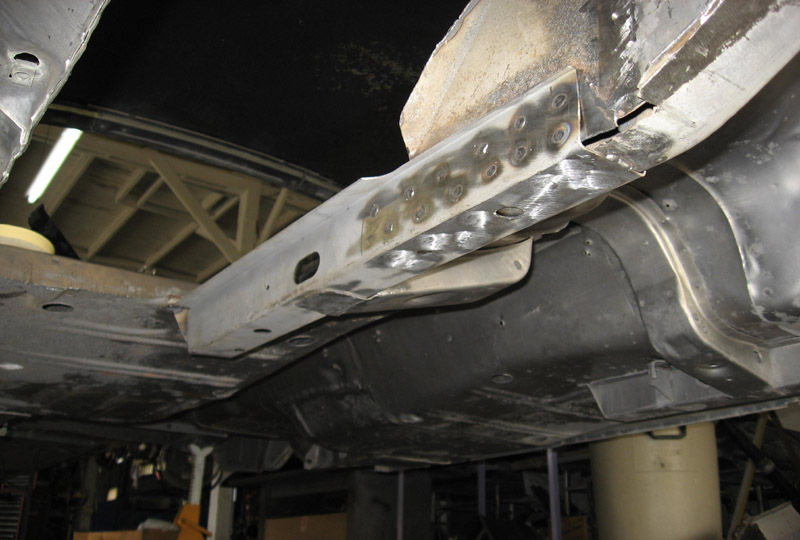 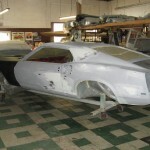 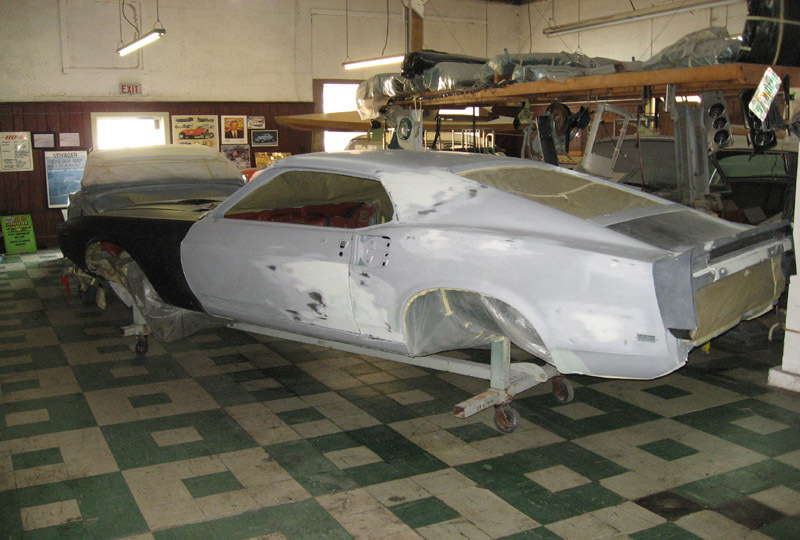 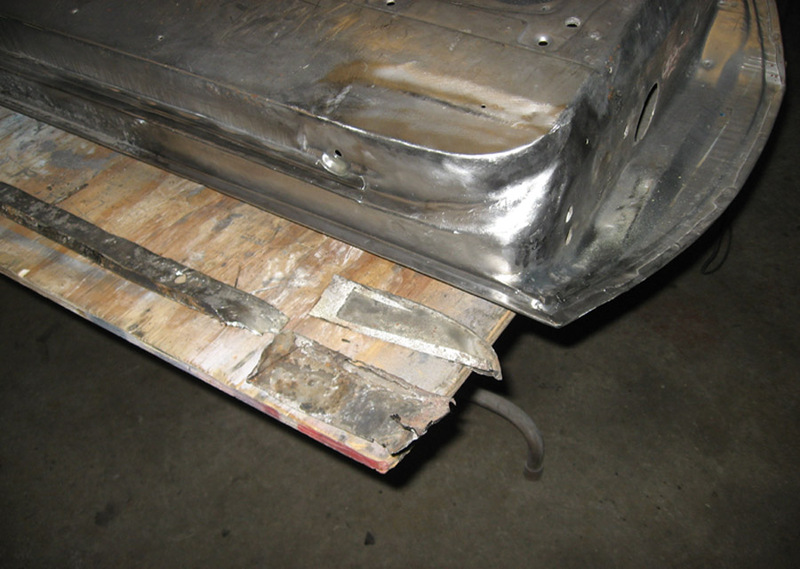 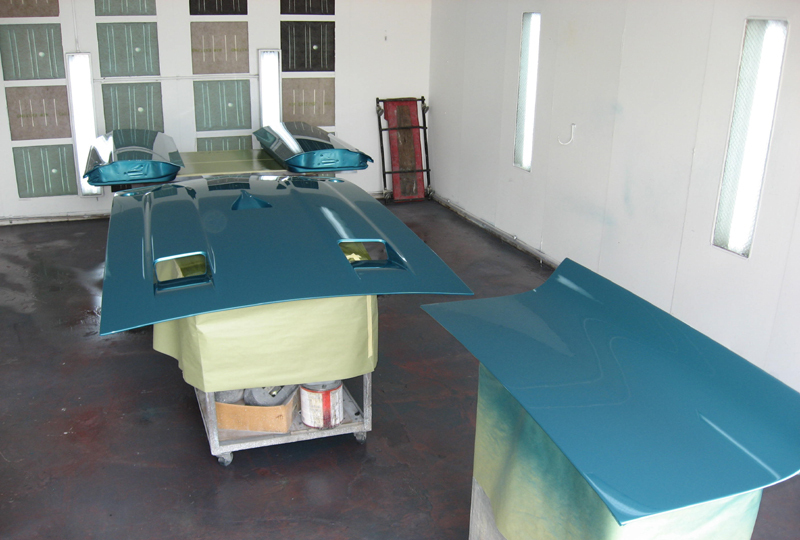 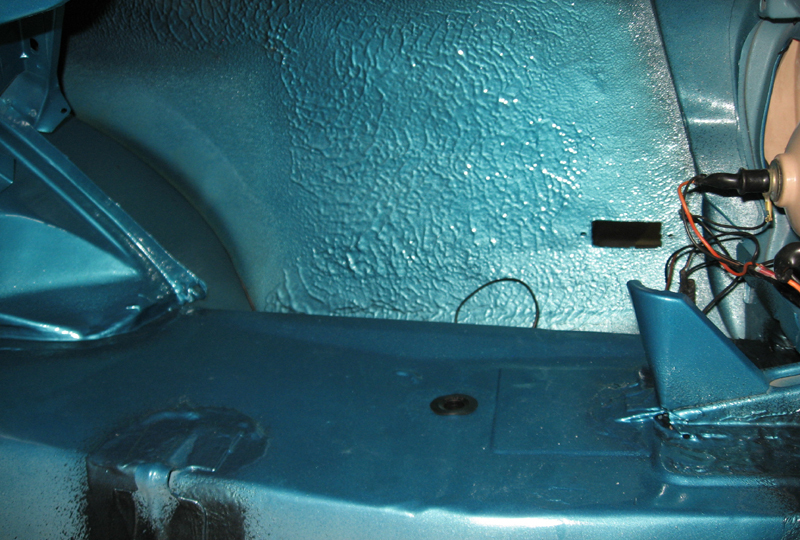 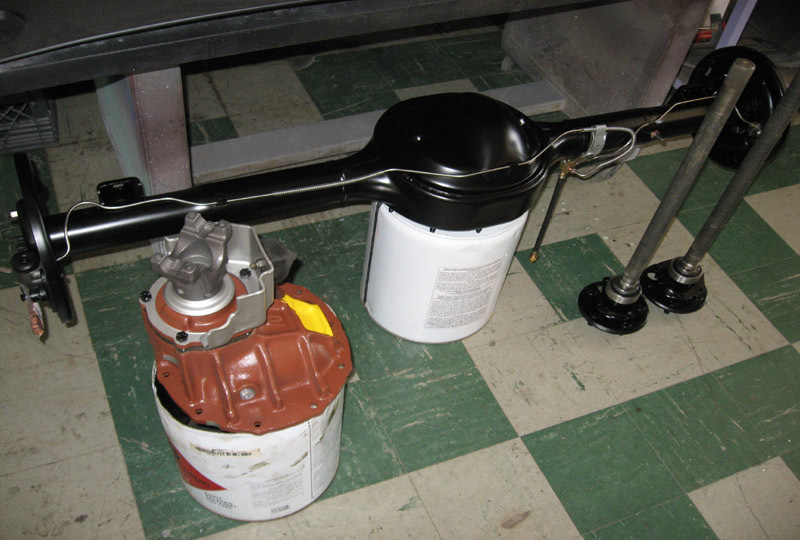 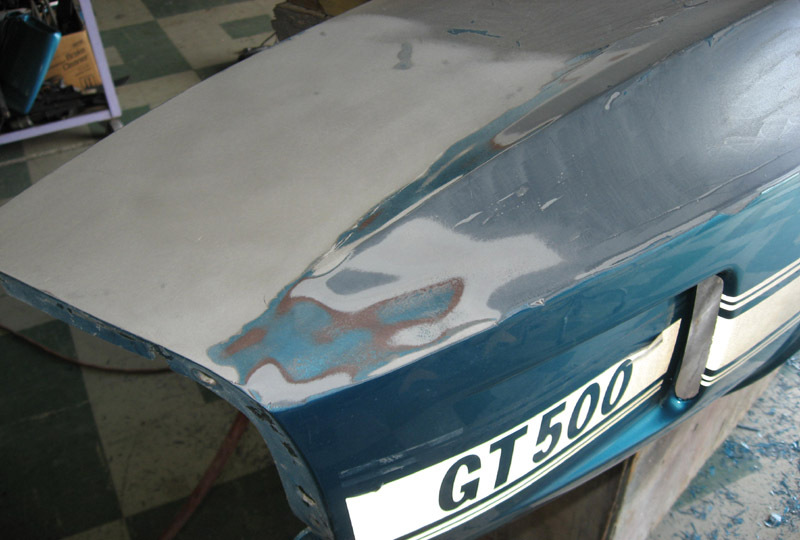 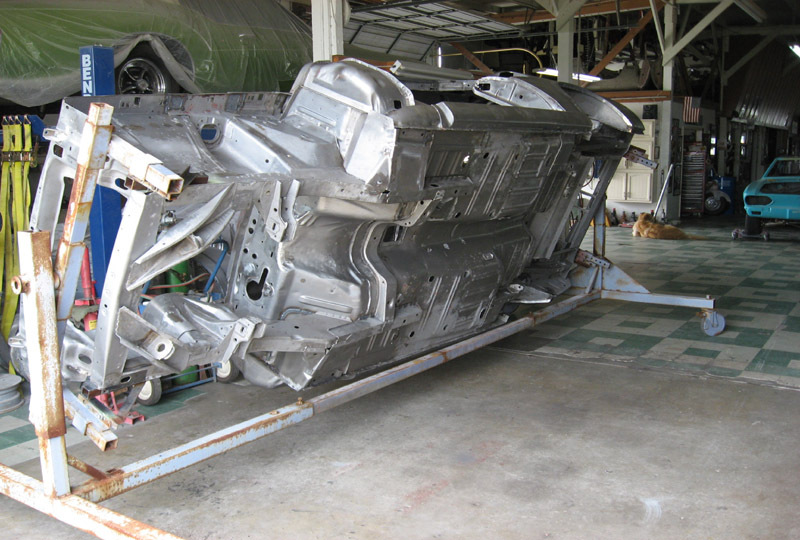 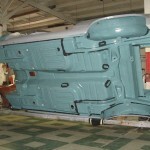 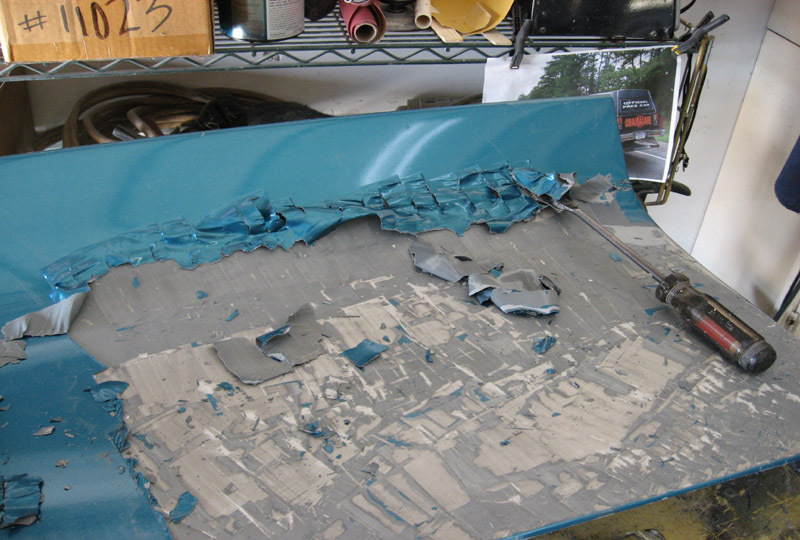 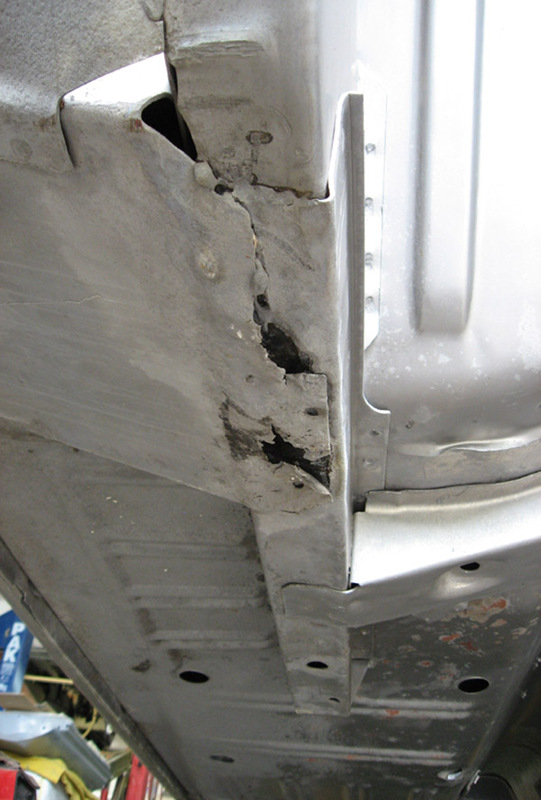 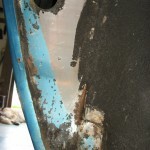 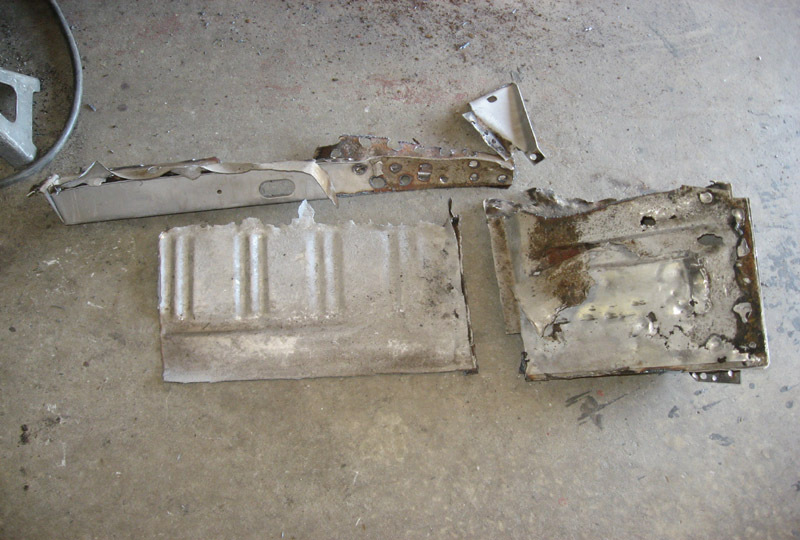 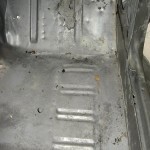 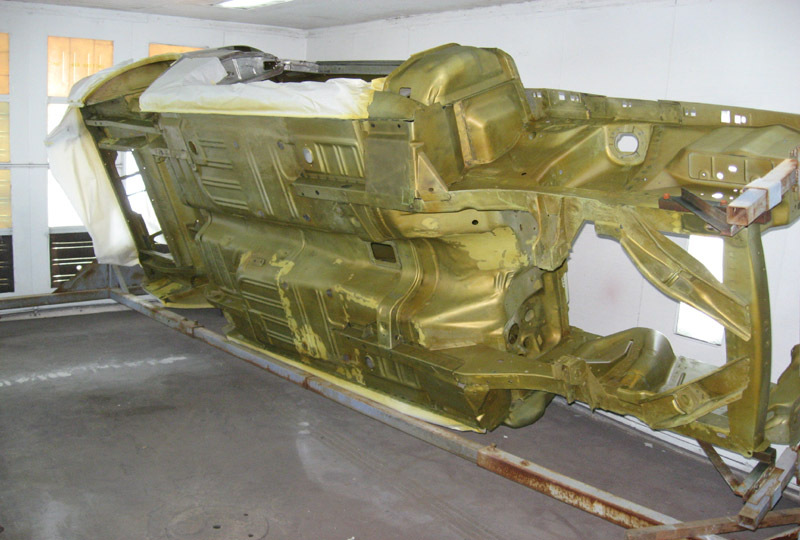 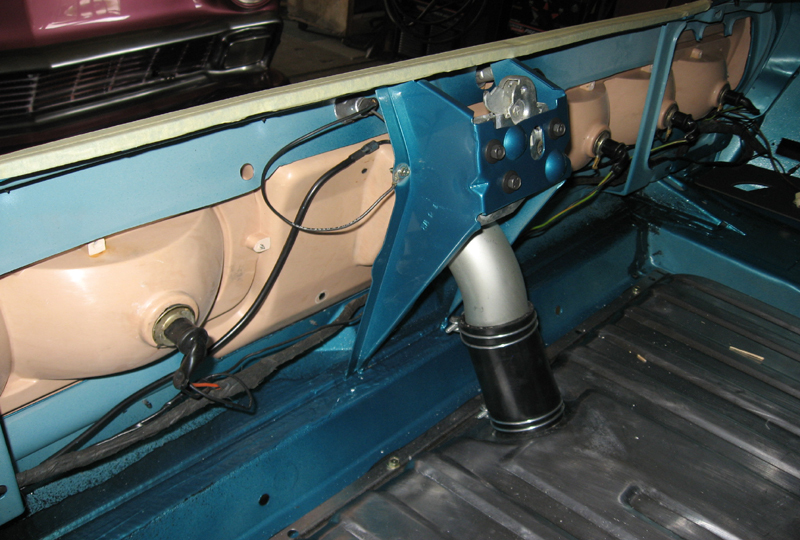 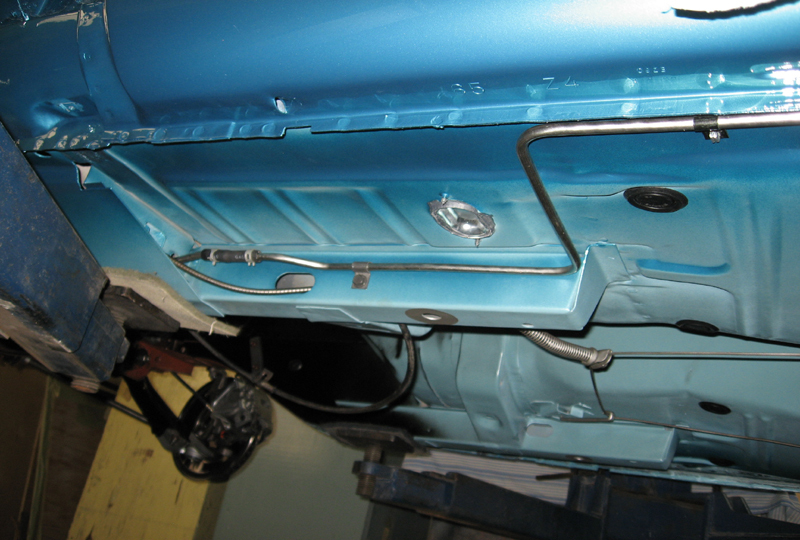 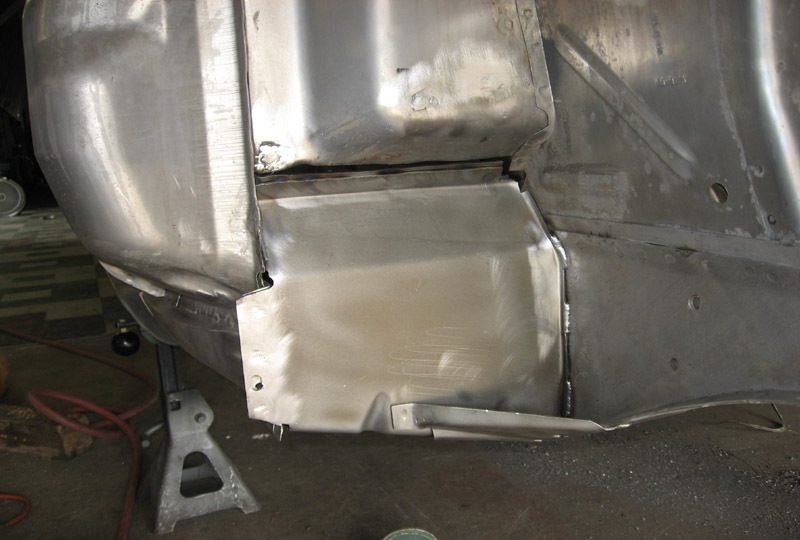 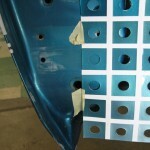 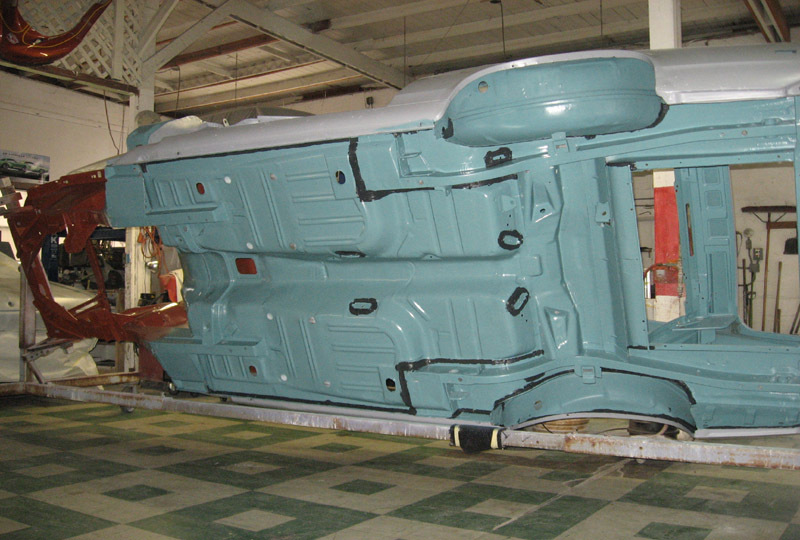 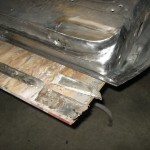 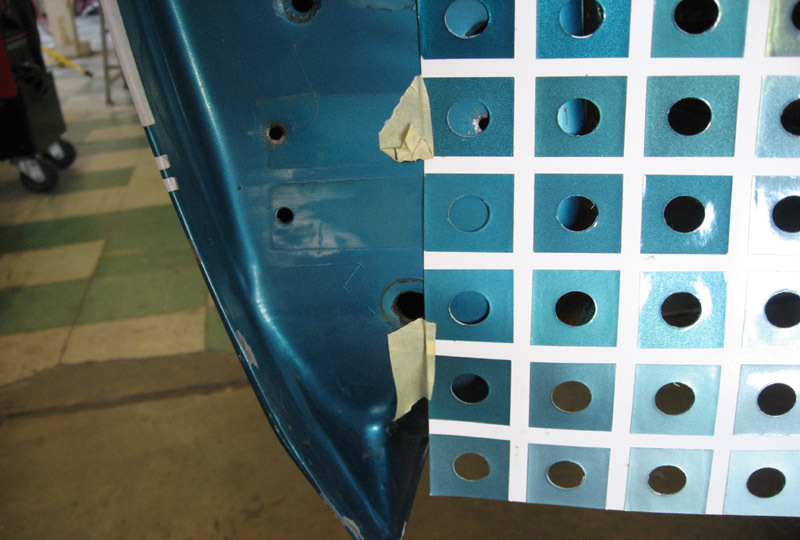 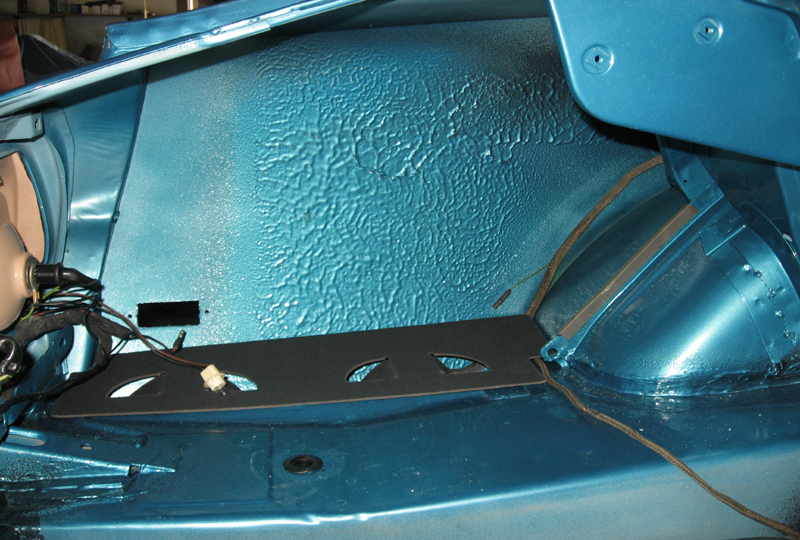 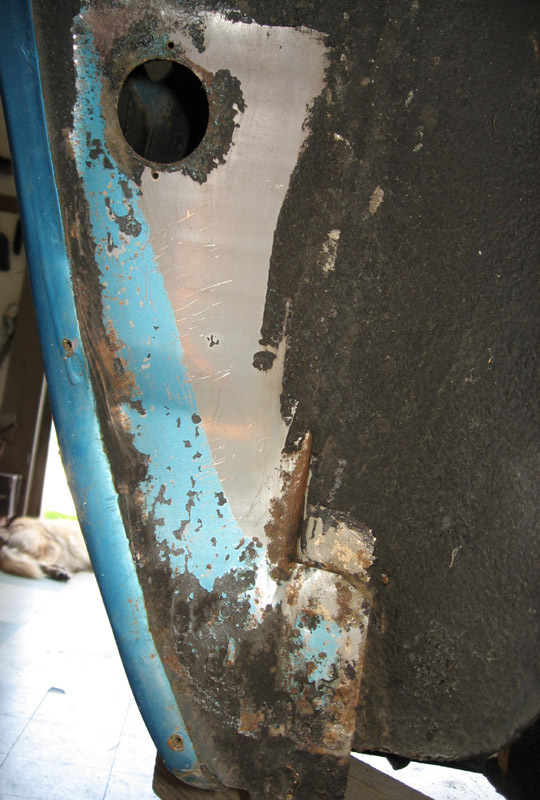 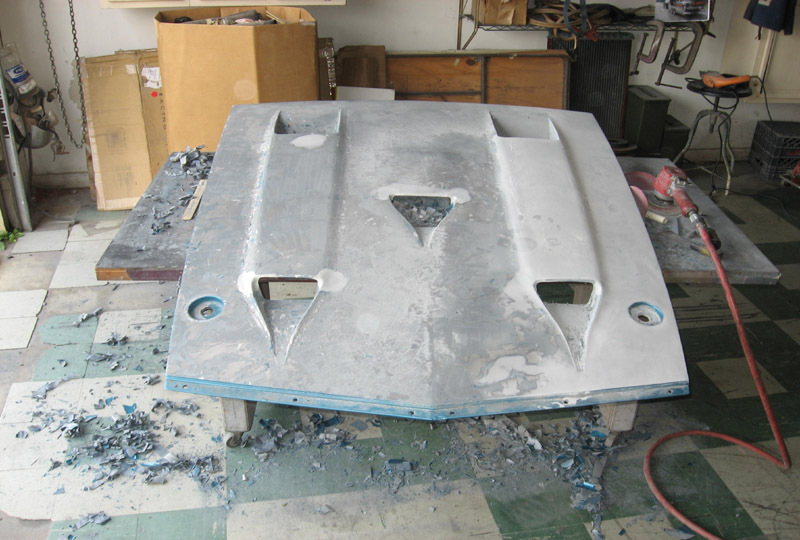 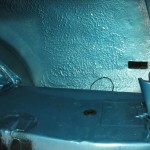 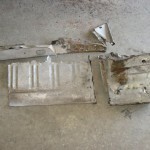 All plastic body panels had the paint removed mechanically while the metal parts and body were sent to the stripper for a chemical strip of all paint products and a de-rust process. 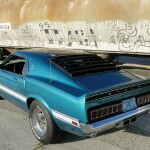 The pictures of that after event are to come in the next update. 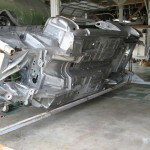 Most subassemblies are completed. 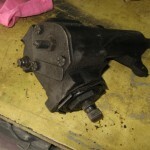 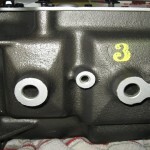 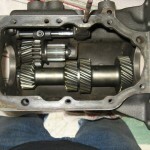 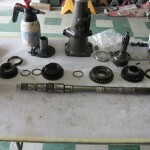 The transmission gave some nice inspector details during the clean up process. 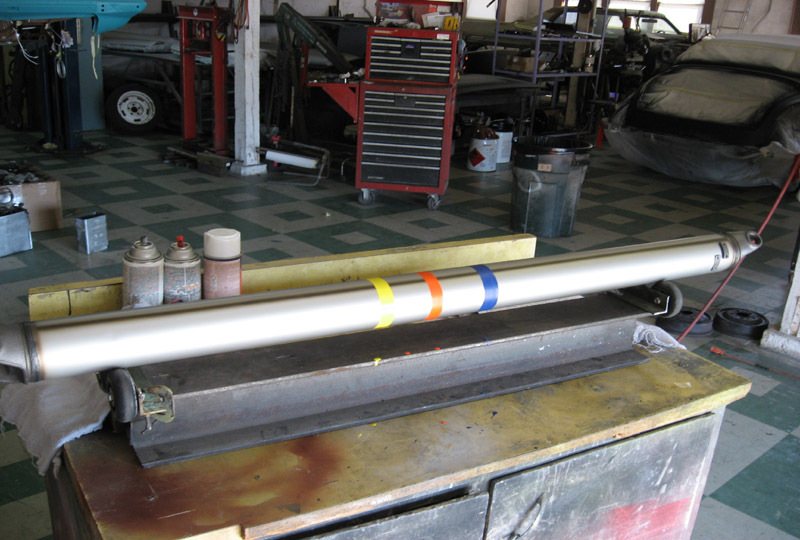 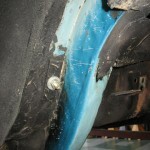 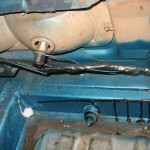 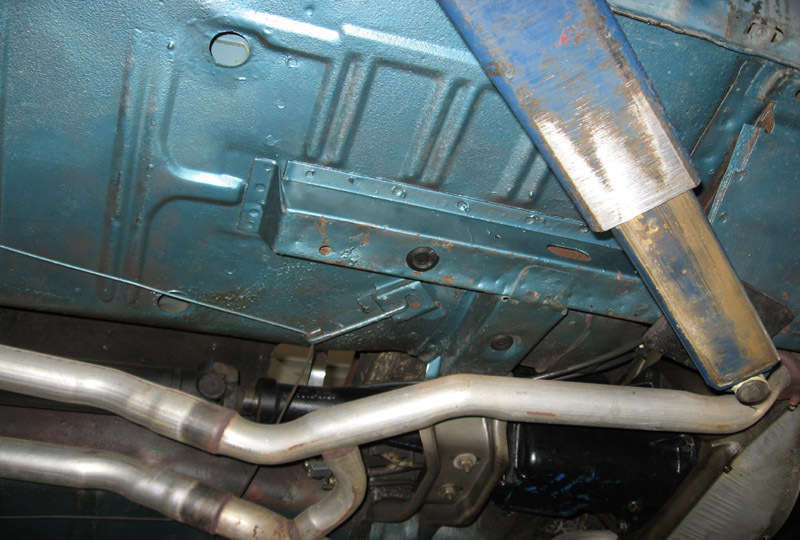 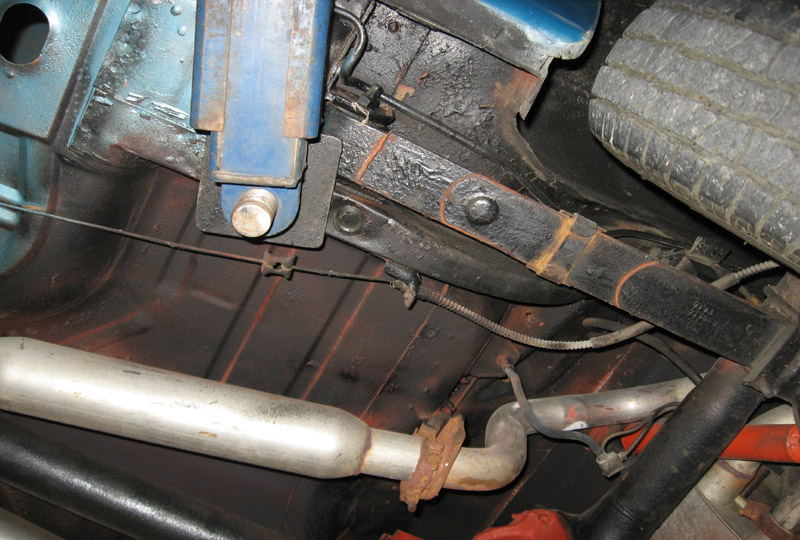 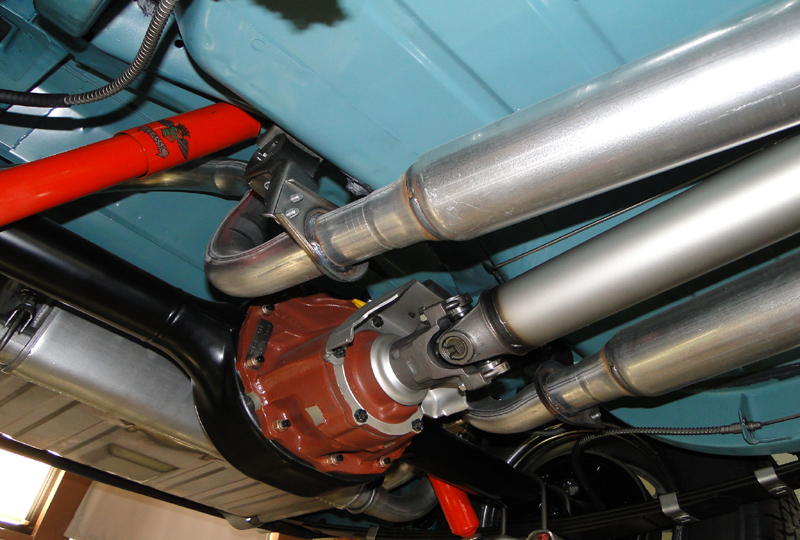 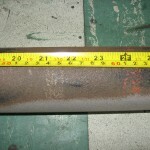 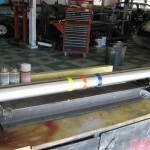 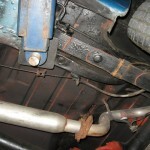 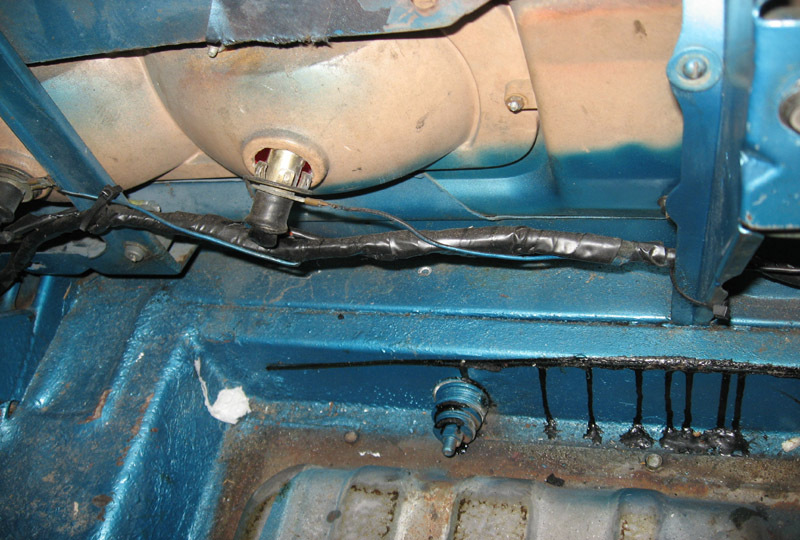 The drive shaft also gave a glimpse of color markings from the past. 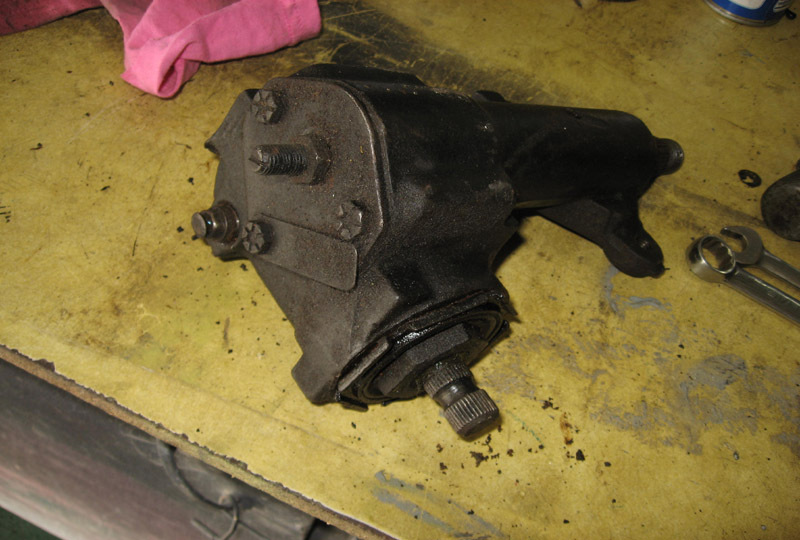 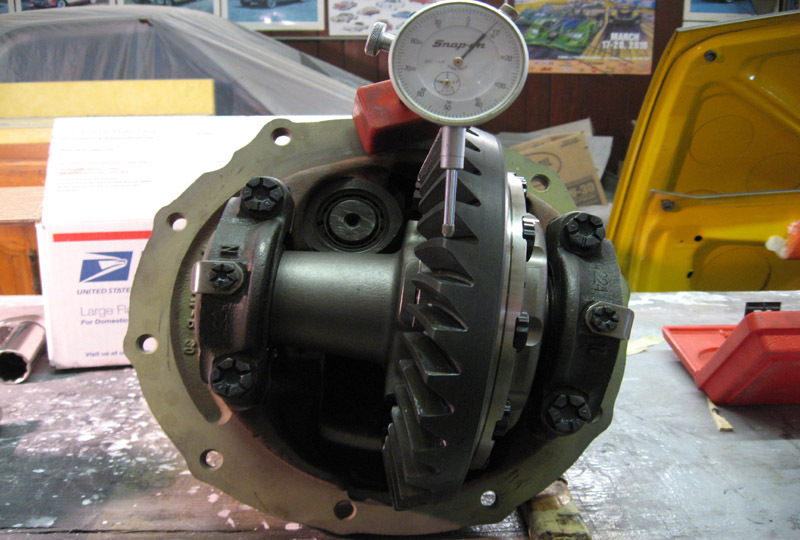 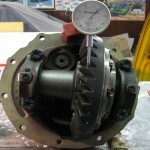 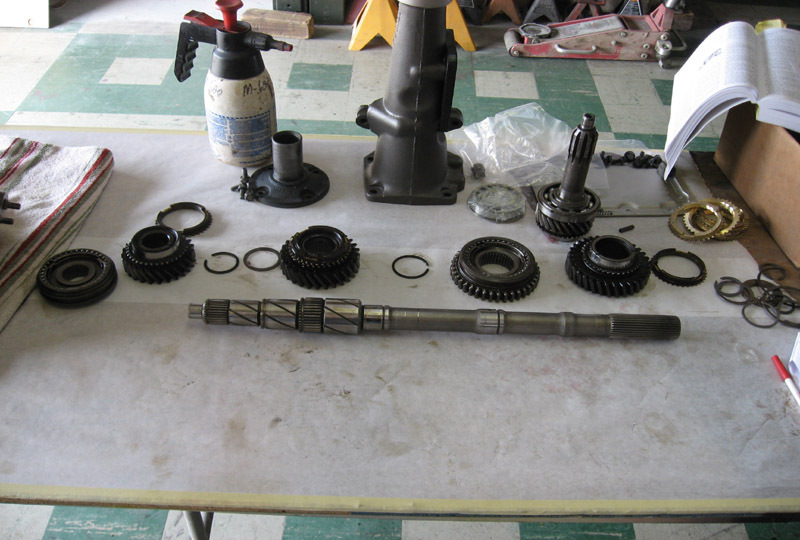 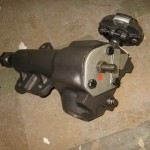 The rear axle is ready for reassembly. 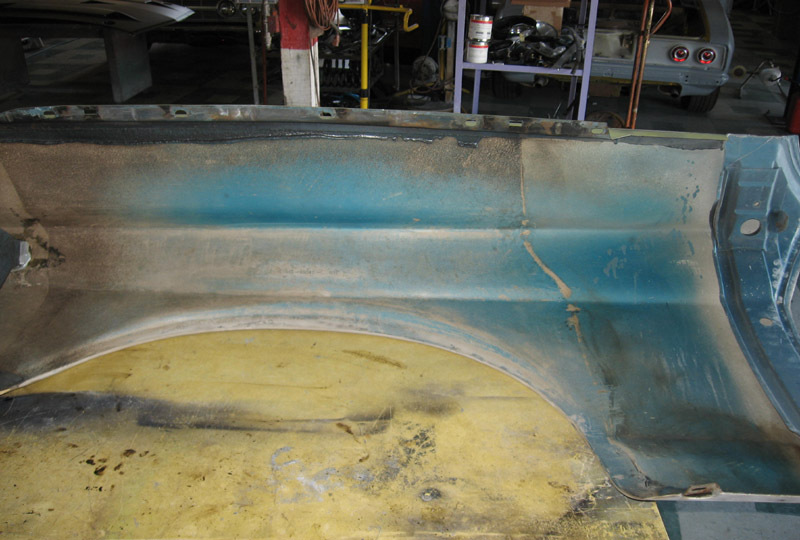 Before and after pictures show the details that were uncovered. 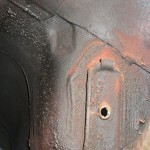 The body has been chemically cleaned and de-rusted and now the metal repair work is under way. 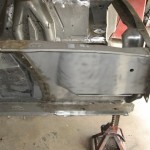 The project is progressing nicely. 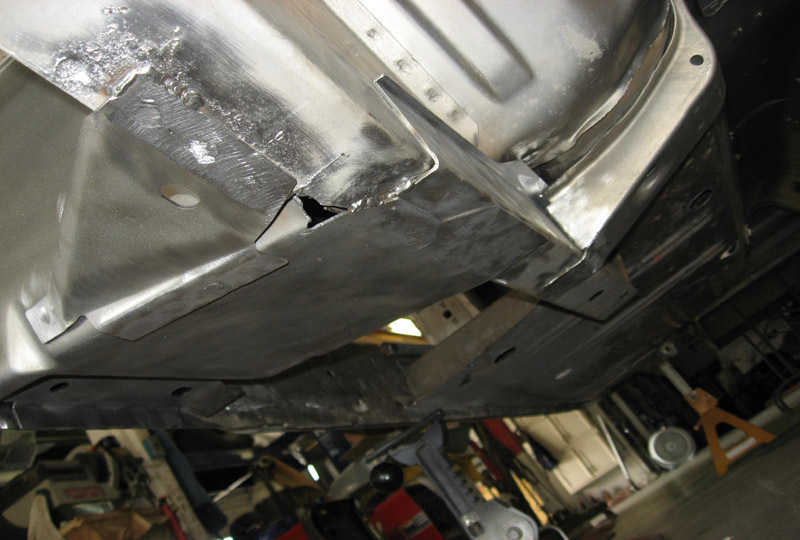 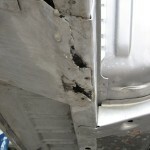 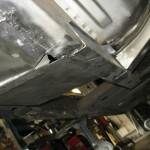 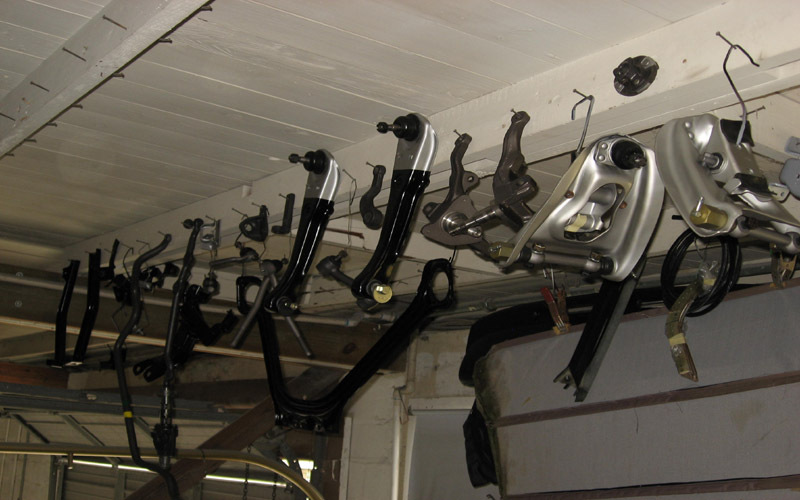 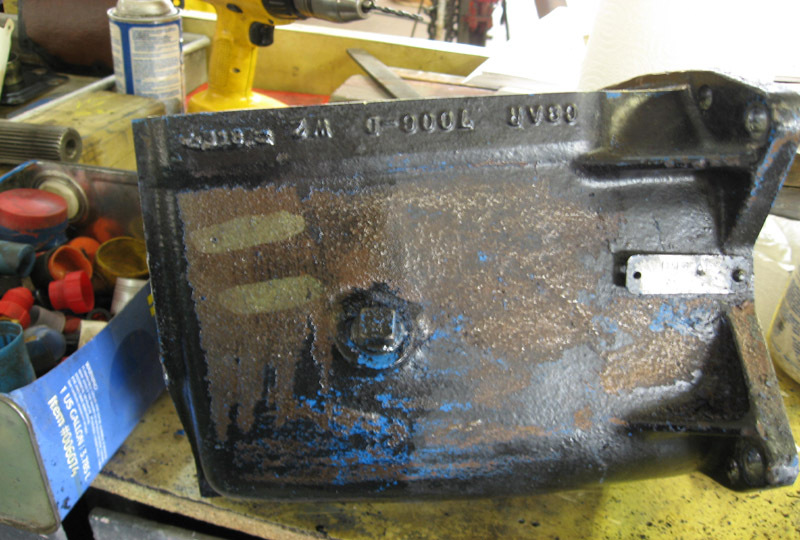 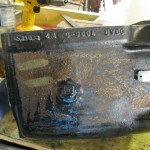 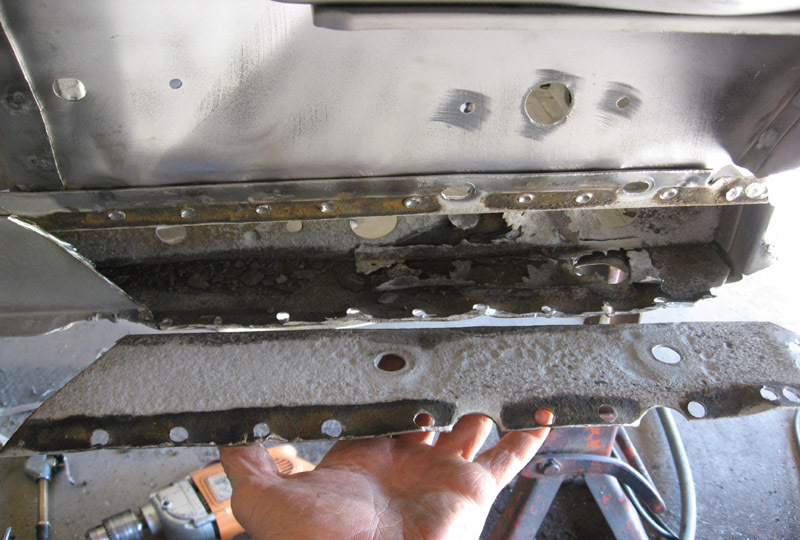 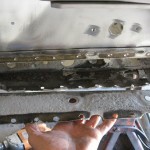 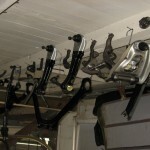 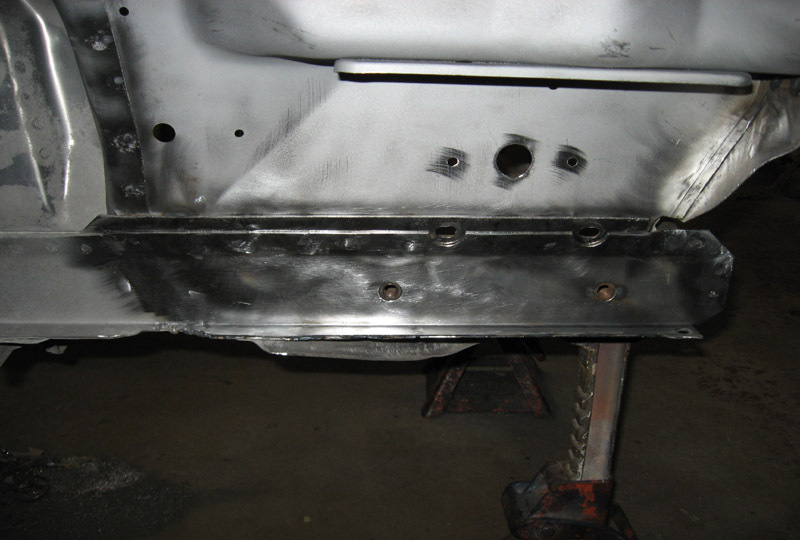 All metal repair work is completed and the first primers, etching and epoxy have been applied. 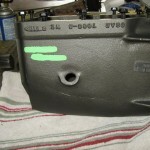 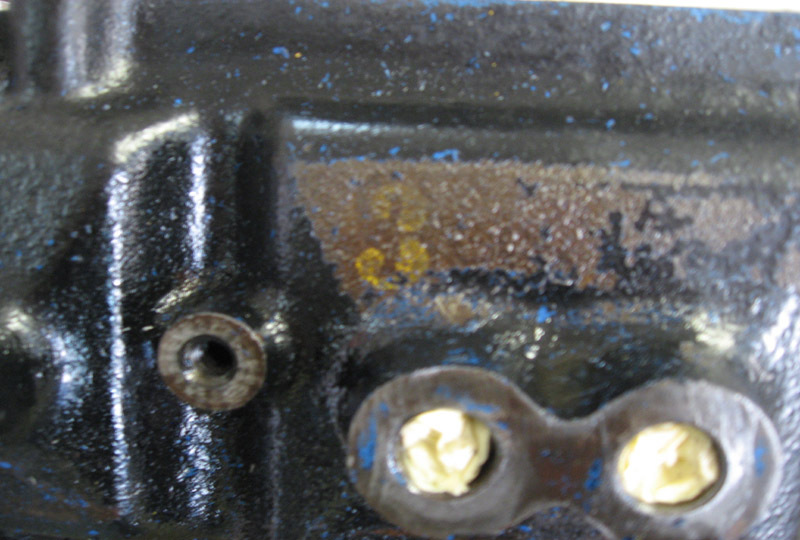 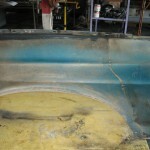 The original belly coloring has also been applied along with the sealant in the appropriate areas. 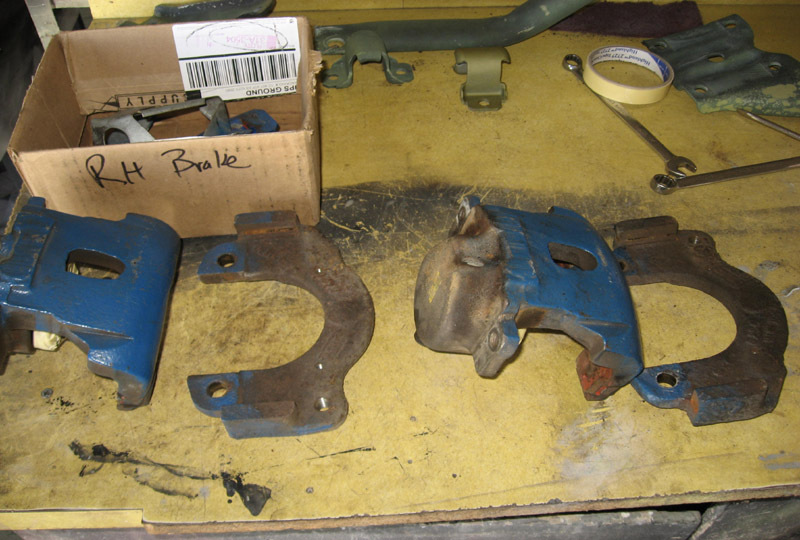 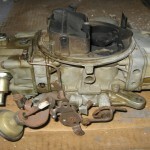 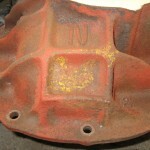 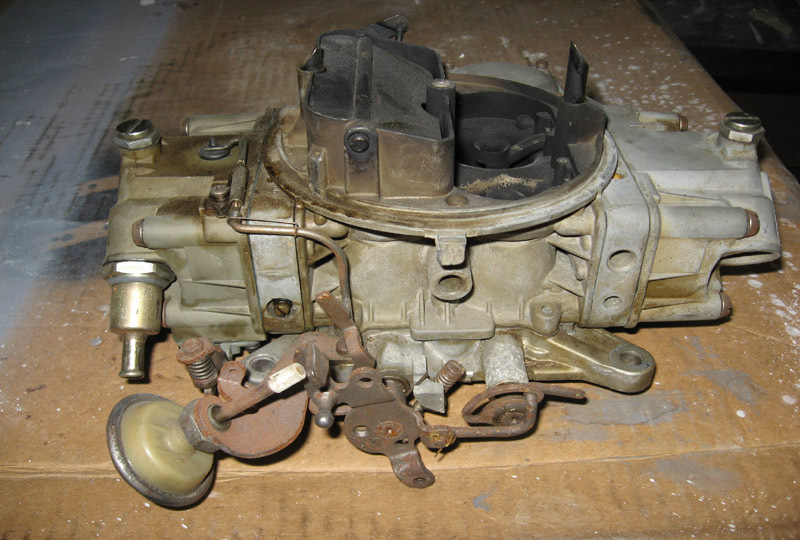 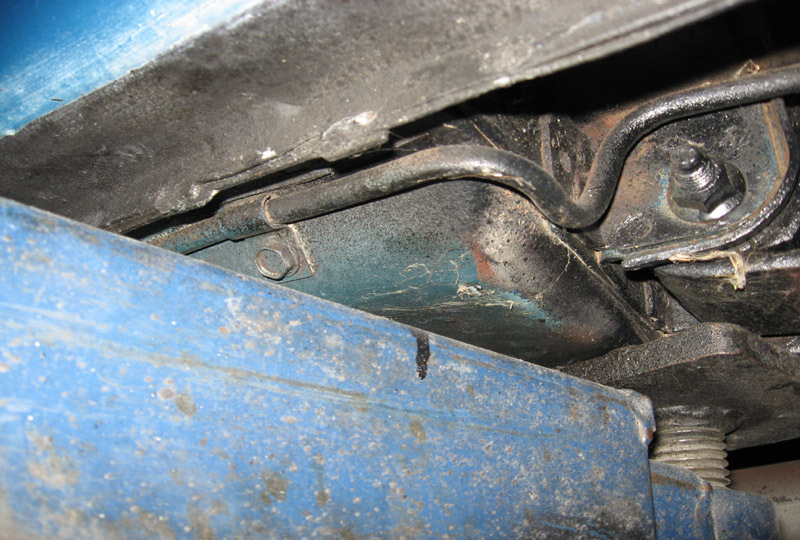 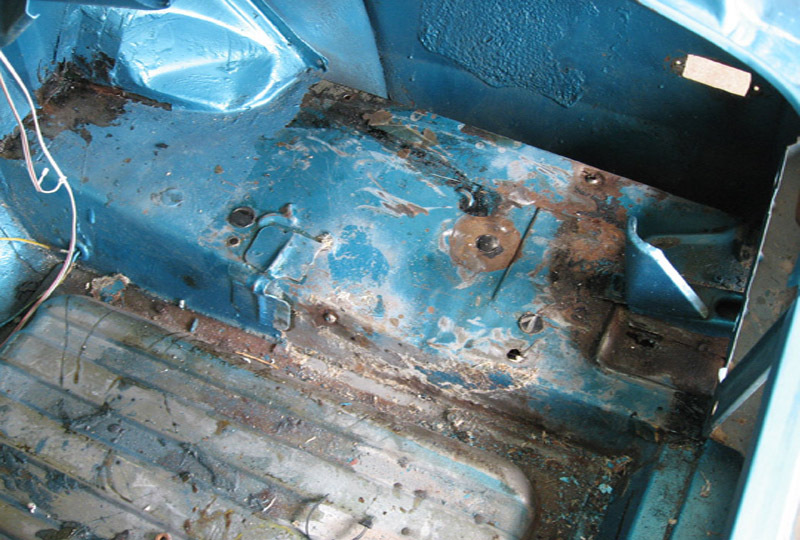 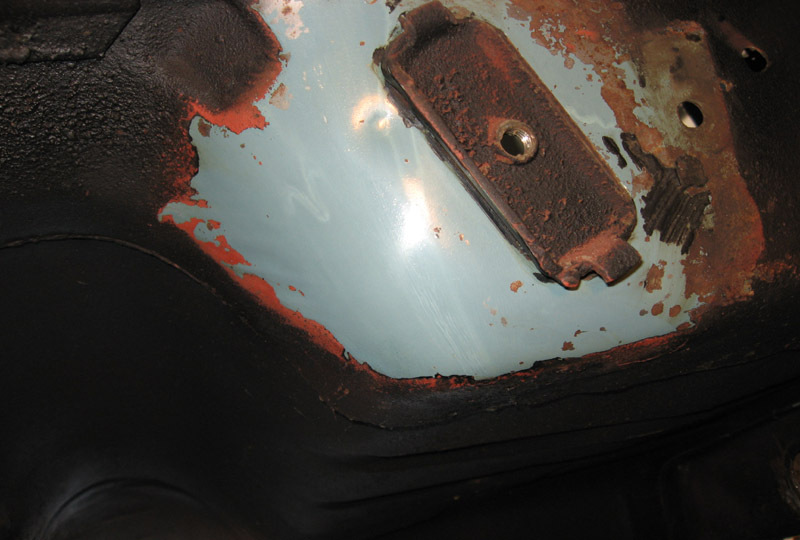 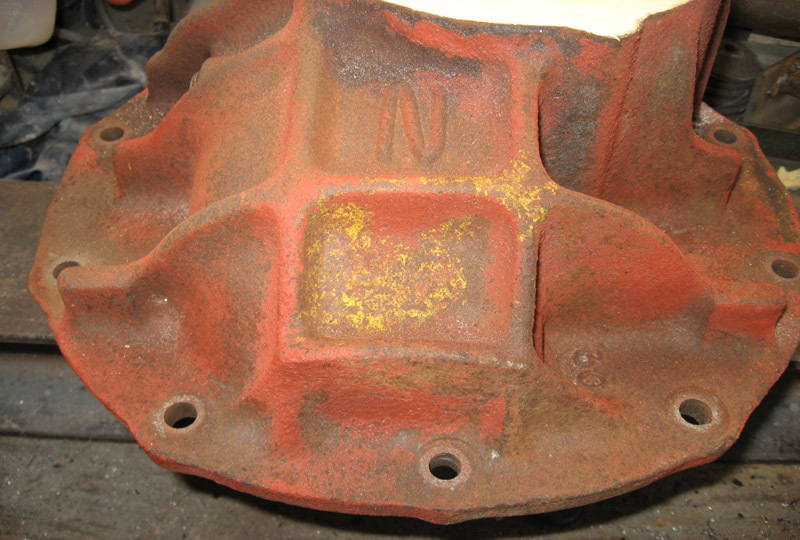 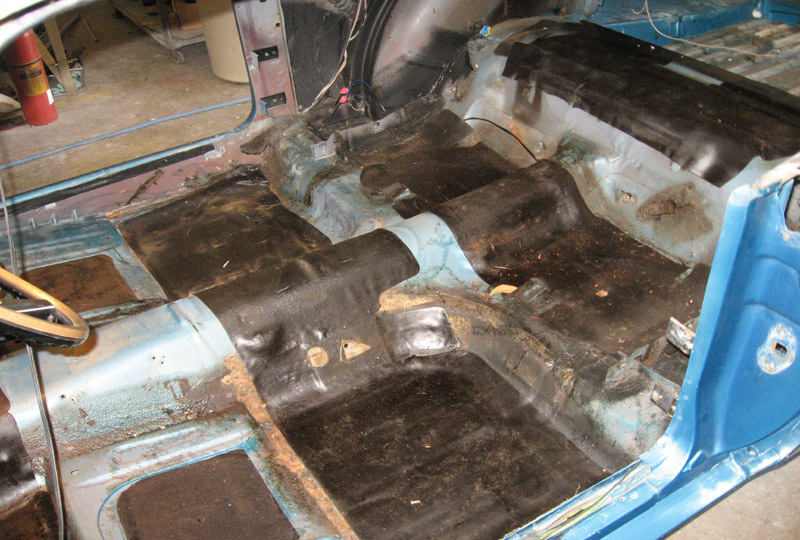 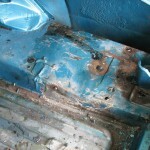 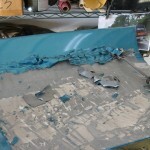 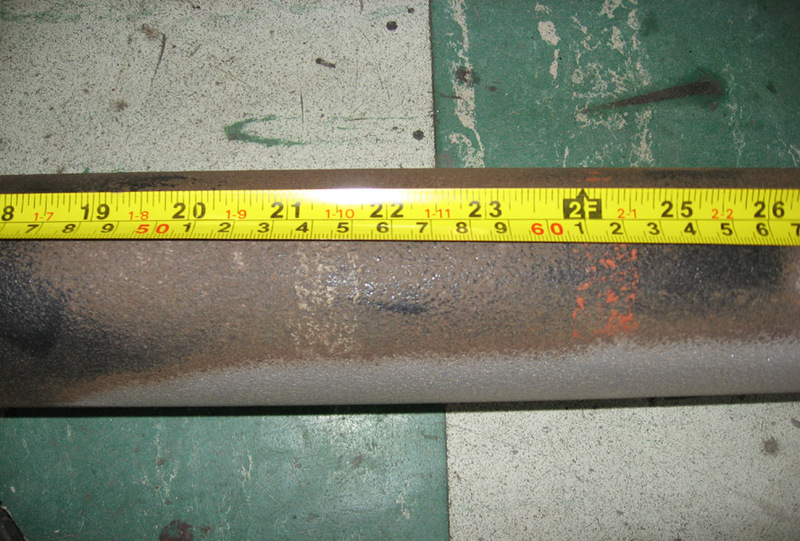 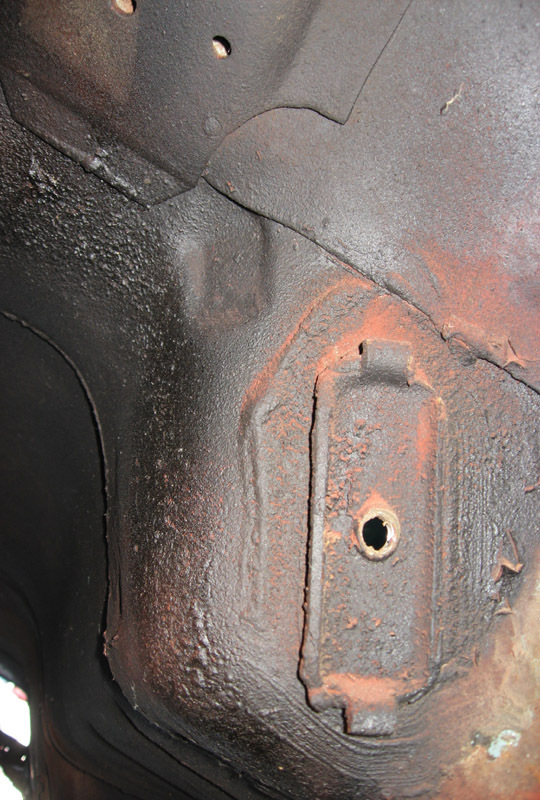 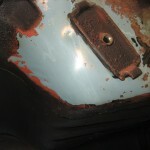 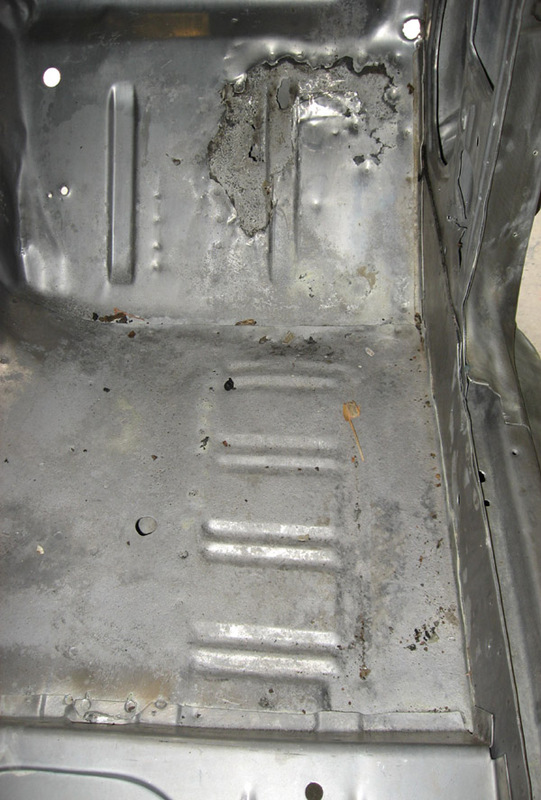 The red oxide was sprayed in the areas where it was found during the disassembly process. 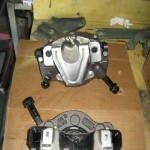 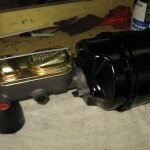 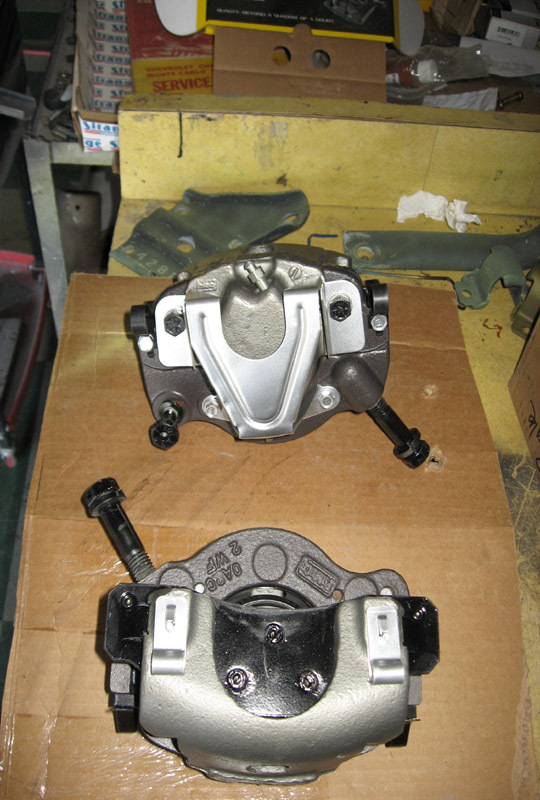 The new transmission components were installed and are ready for some more miles of gear grabbing. 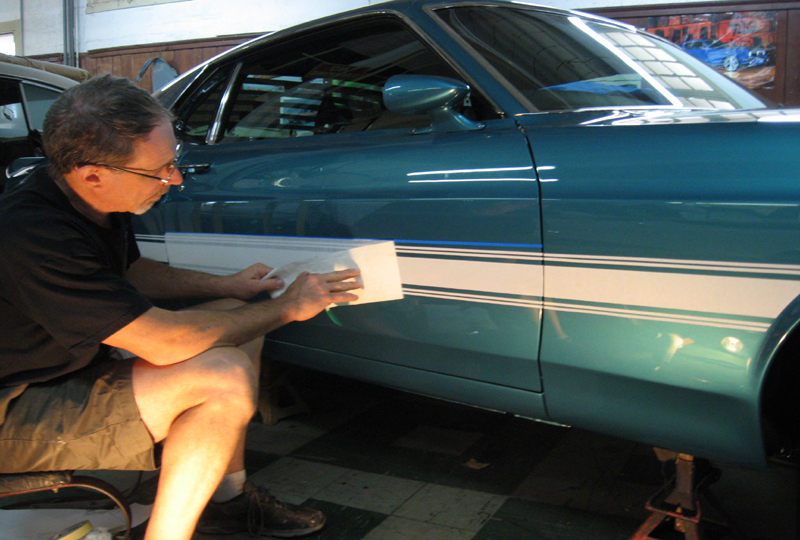 Body work and panel fitment are the next components of the Shelby’s new lease on life. 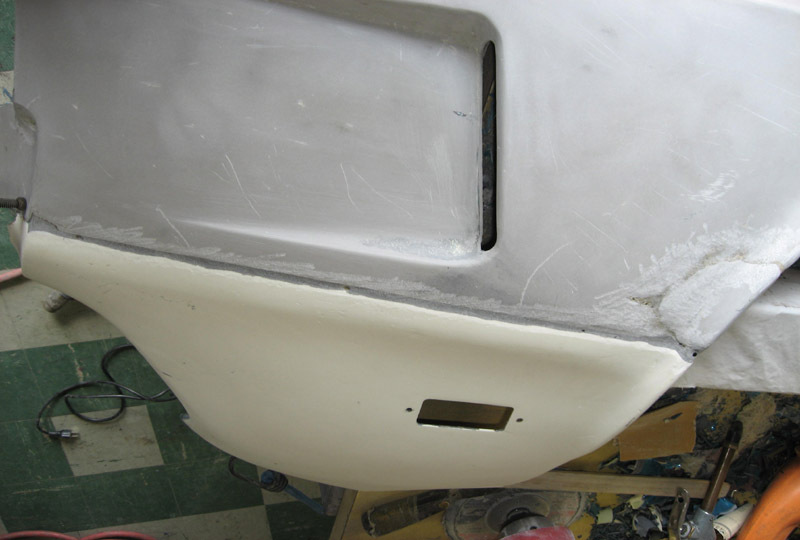 All body panels have been remounted and aligned to within adjustable ranges to allow for the best fit transition from panel to panel. 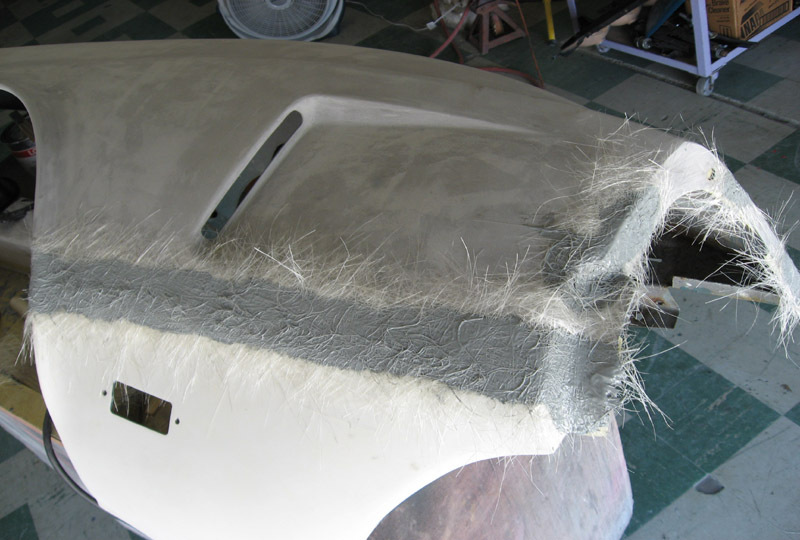 As each panel is squared and leveled an application of a high build primer is applied for the final block or board sanding to achieve the straightest possible finish. 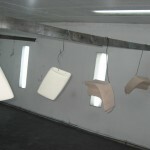 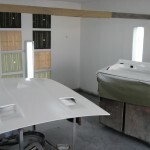 At this phase we know the panels are ready and the final primer coat will be applied as seen in the all white panels. 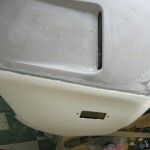 Some new parts such as the front fender well parts are pre-fit. 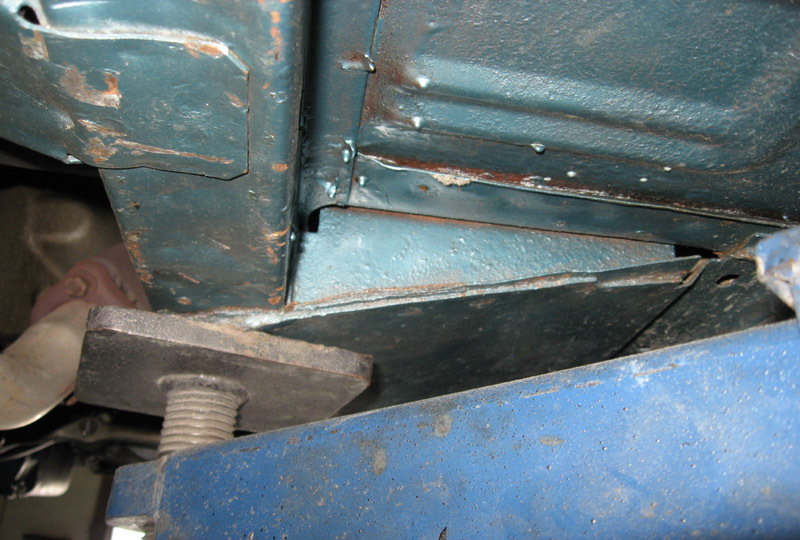 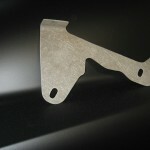 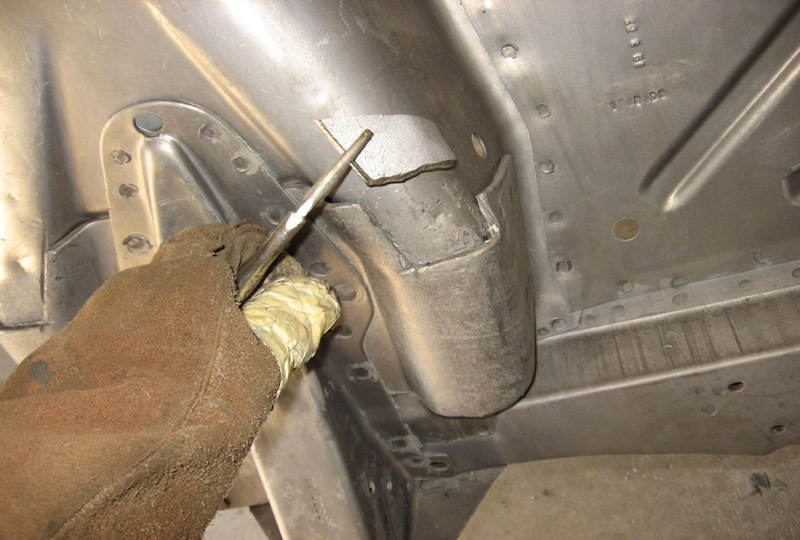 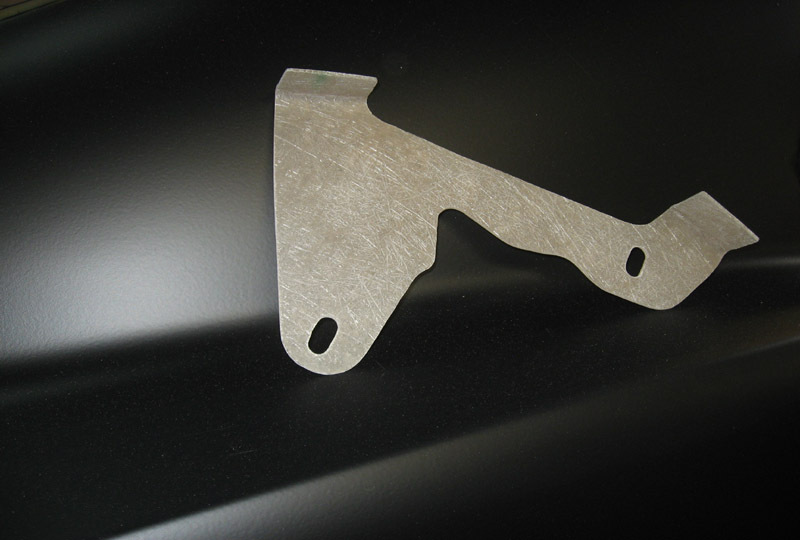 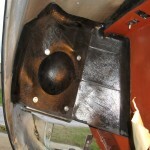 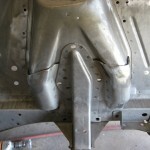 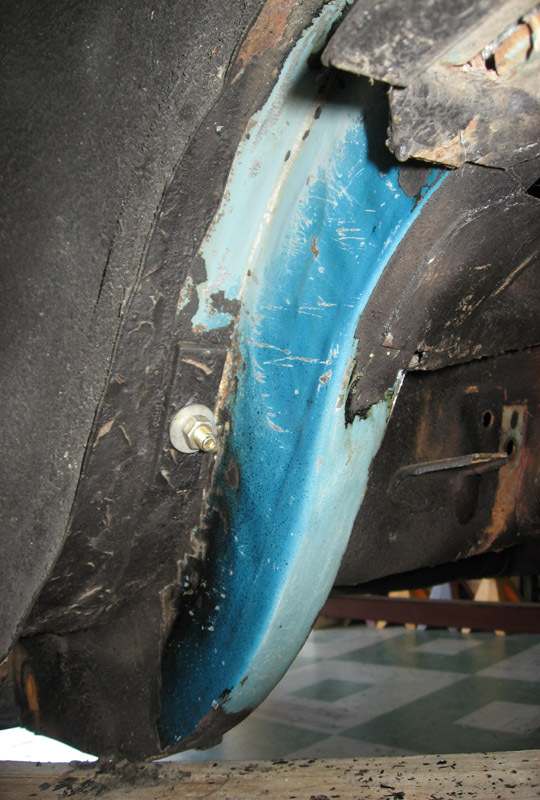 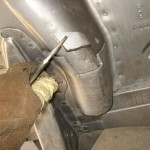 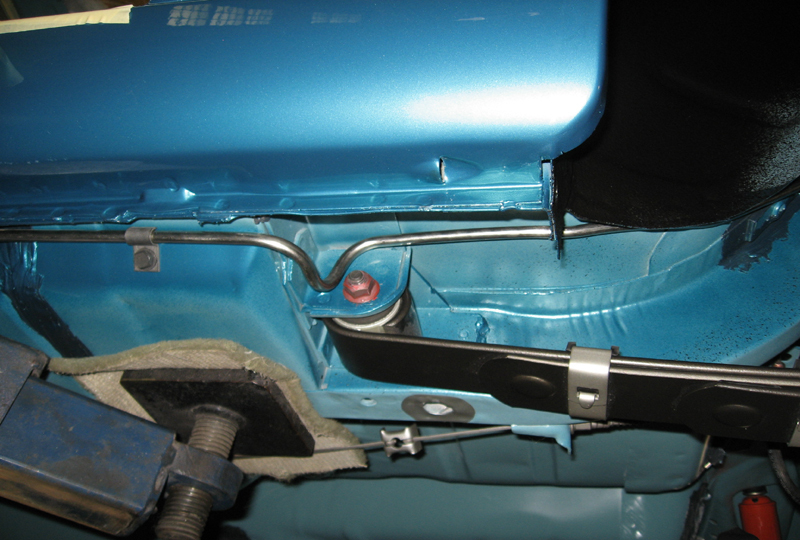 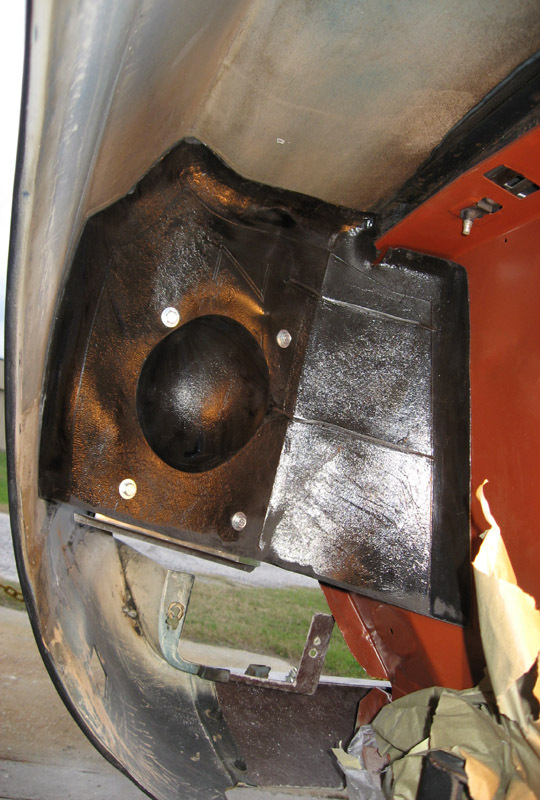 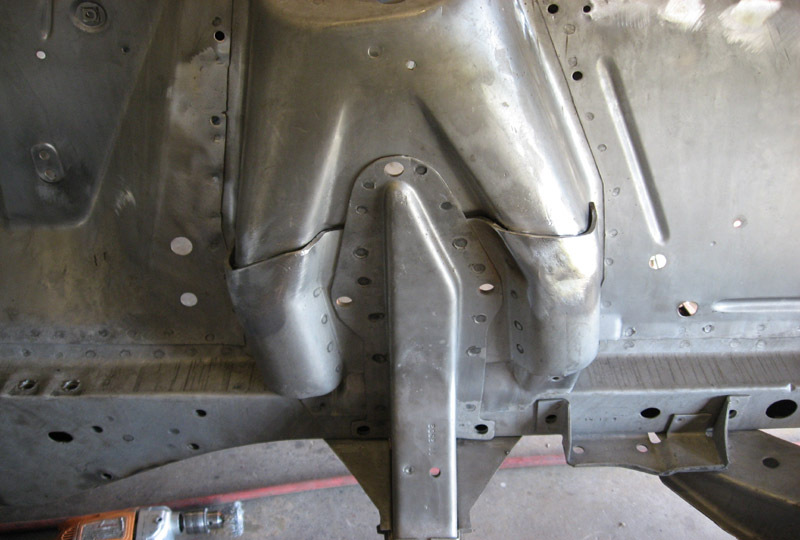 In the case of the left front fender we fabricated a new inner baffle mounting bracket to complete the process. 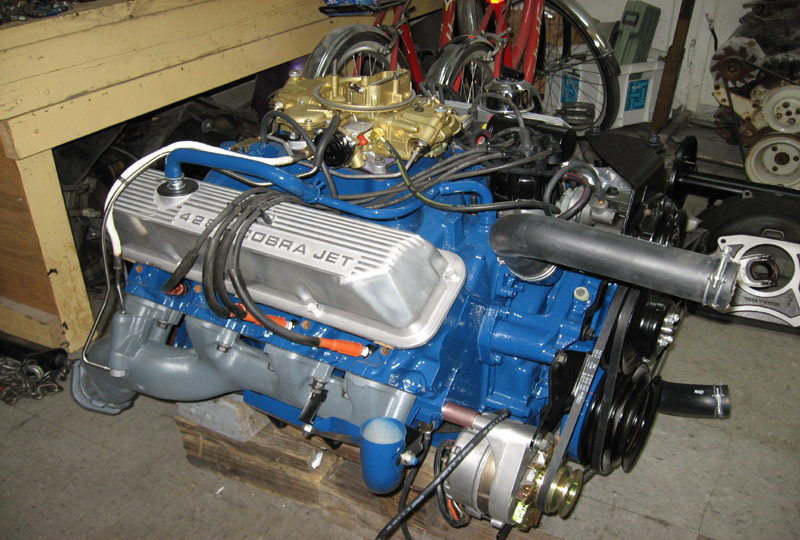 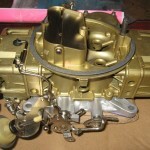 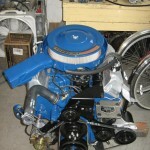 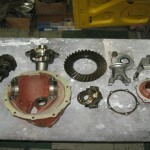 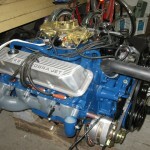 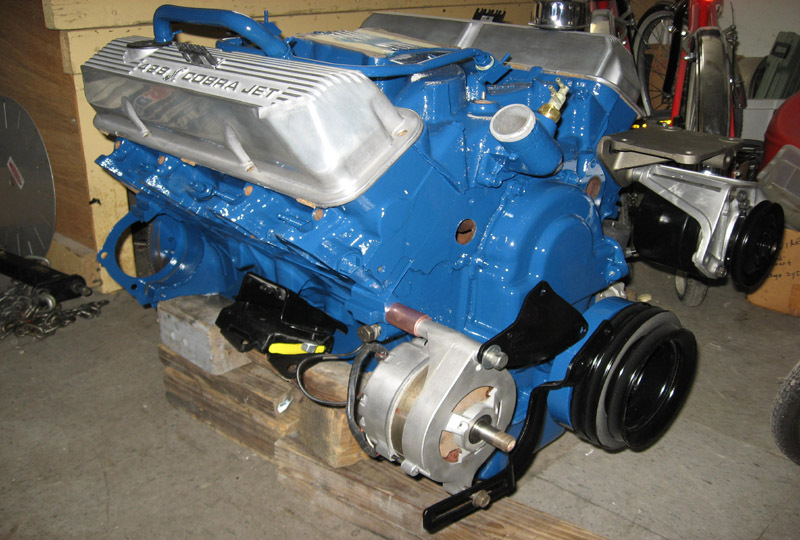 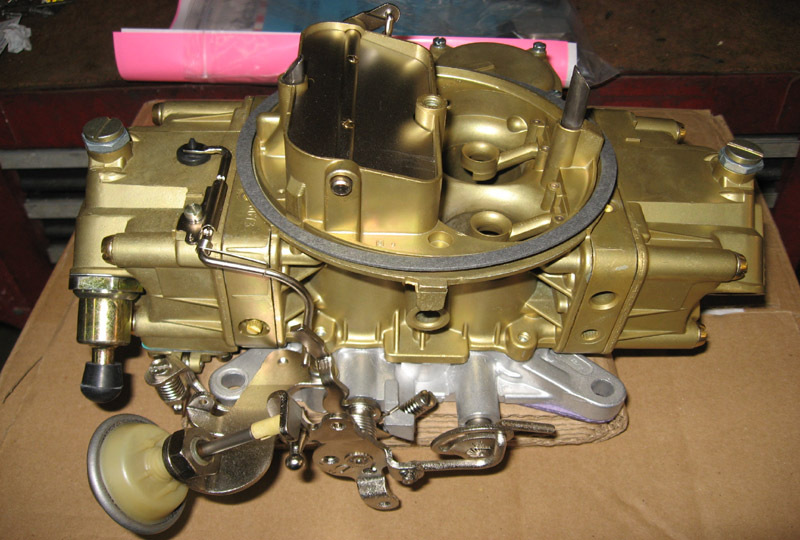 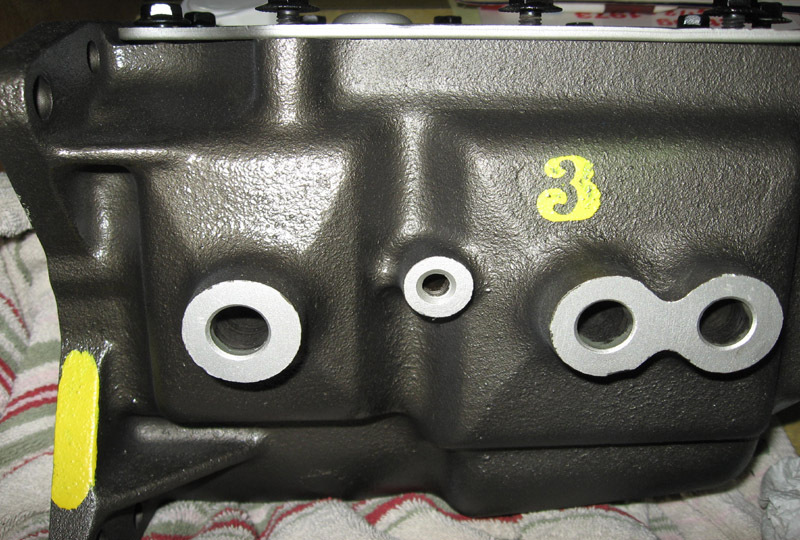 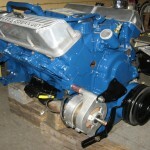 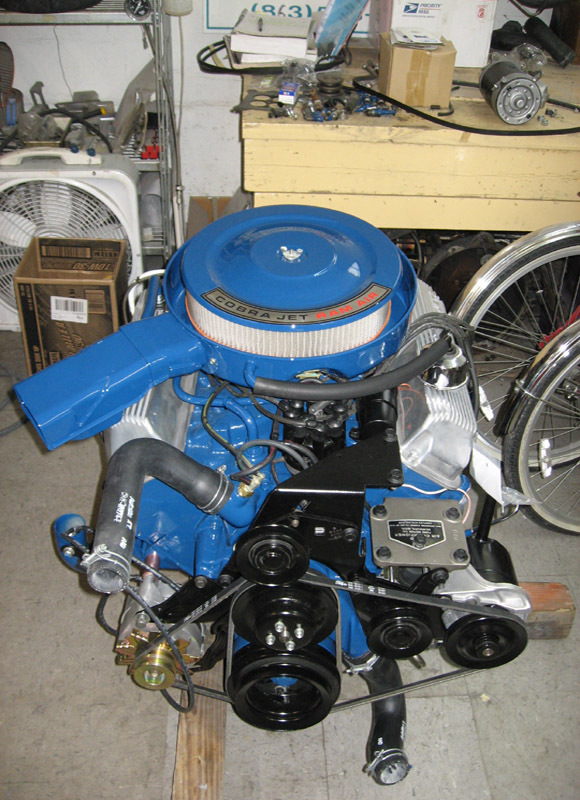 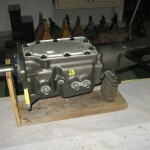 The engine has also returned from the machine shop with all fresh internals. 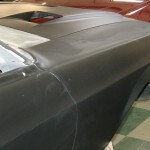 The accessories are now being attached as they are refinished. 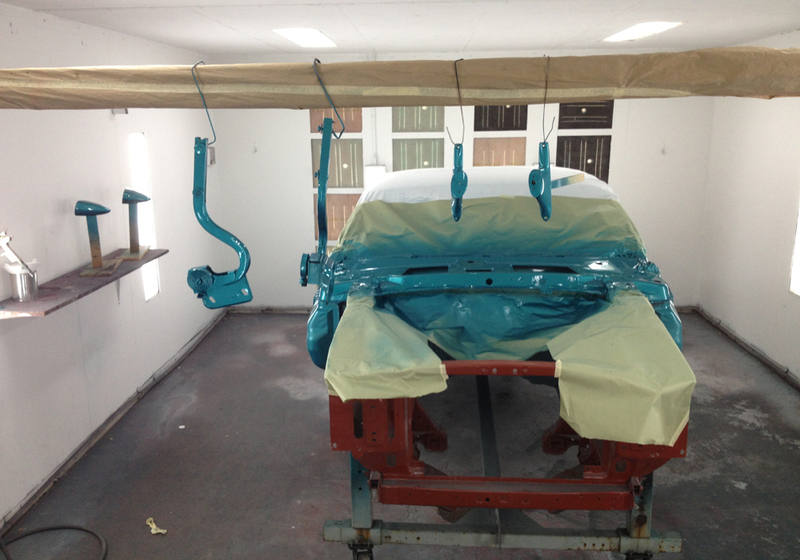 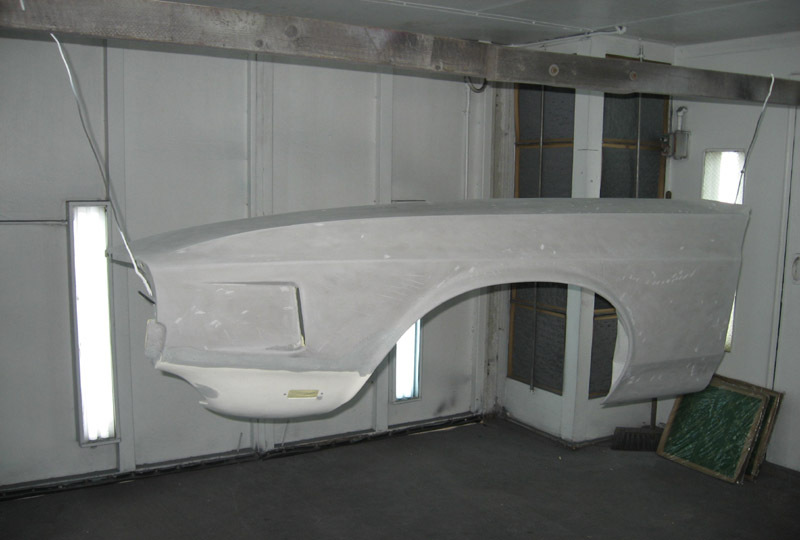 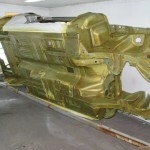 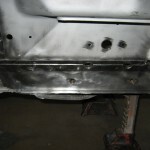 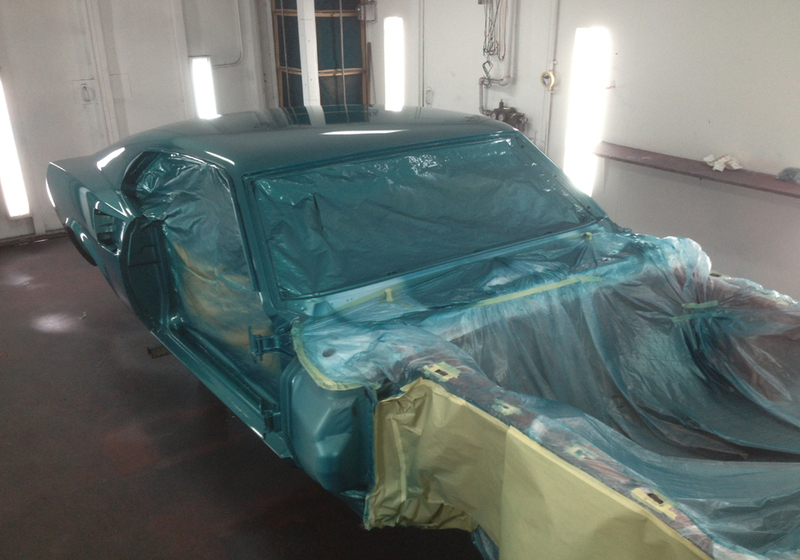 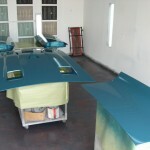 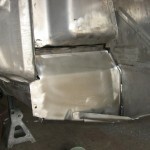 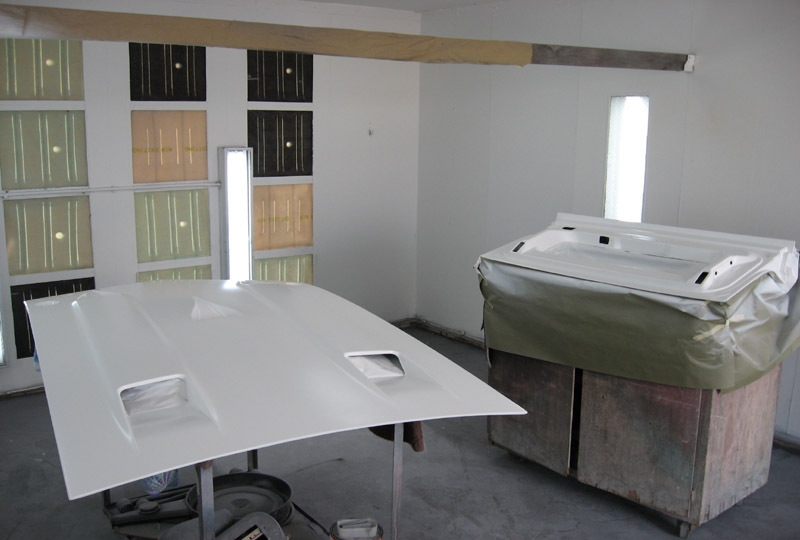 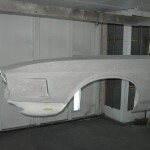 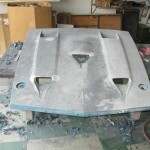 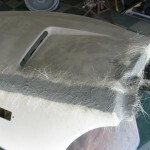 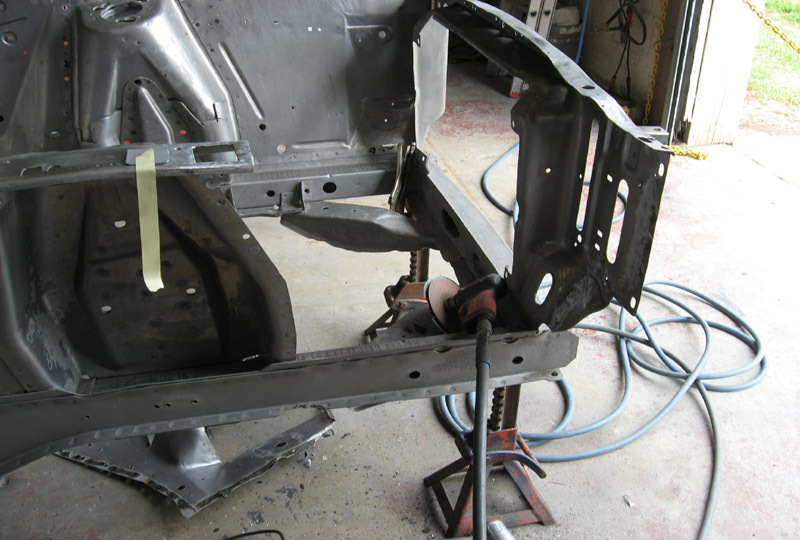 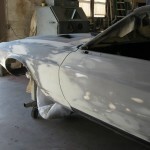 The body work phase is coming to an end as panels are giving their application of final primer. 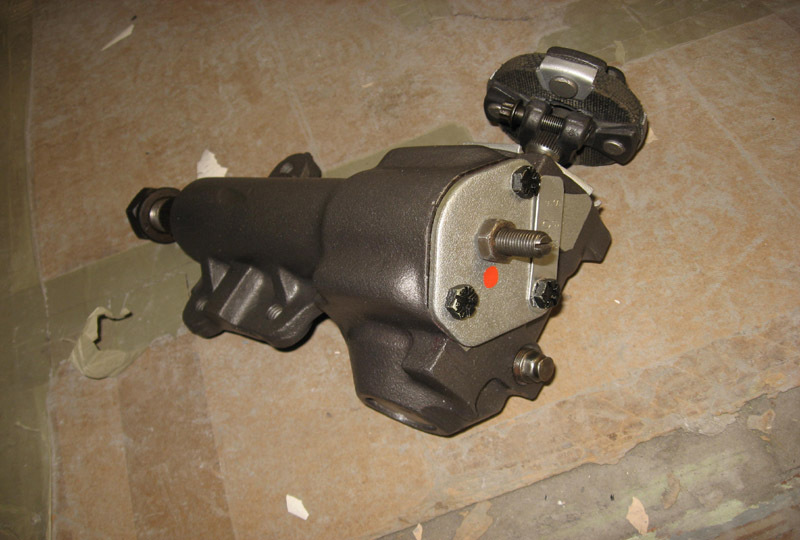 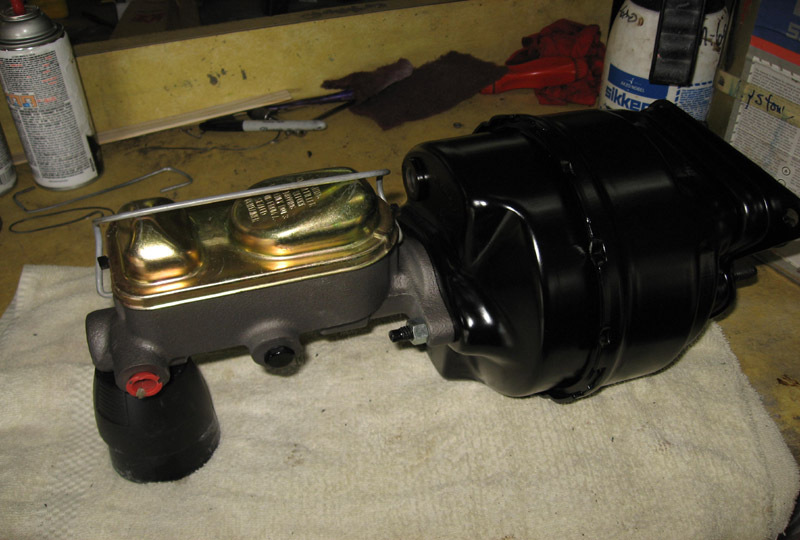 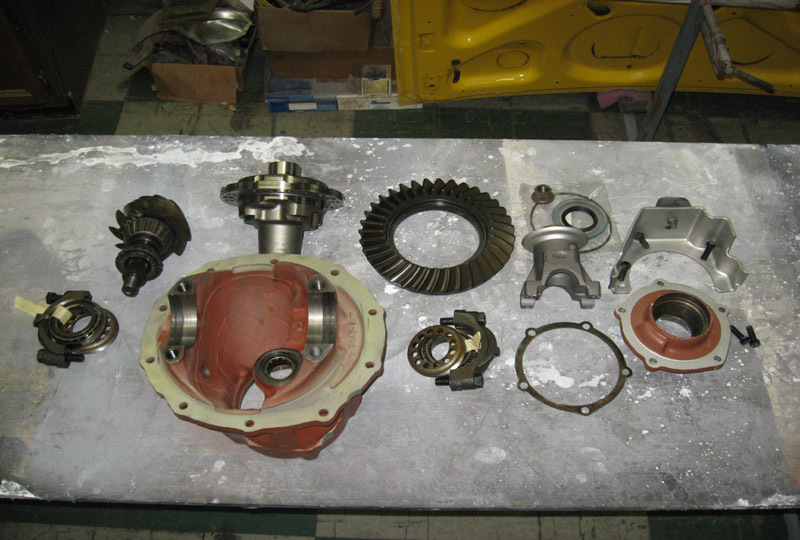 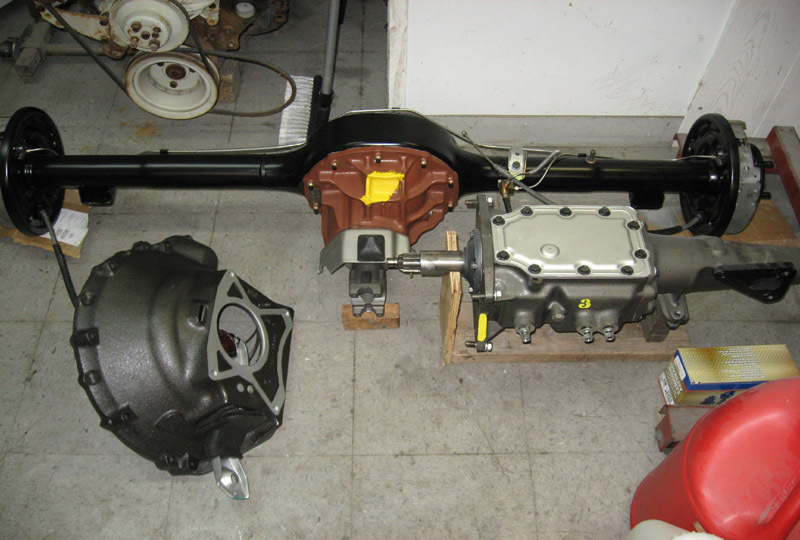 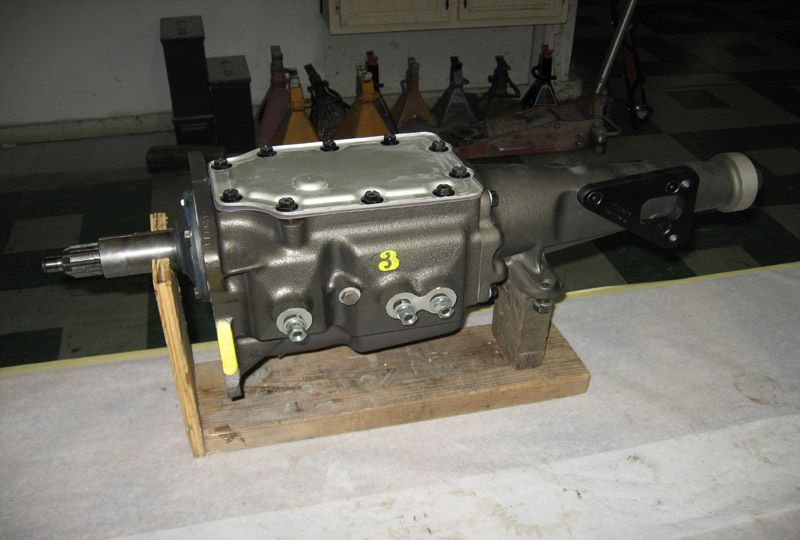 The drive line components, Locker rear axle, Top Loader transmission and 428 CJ engine are all completed and waiting for installation. 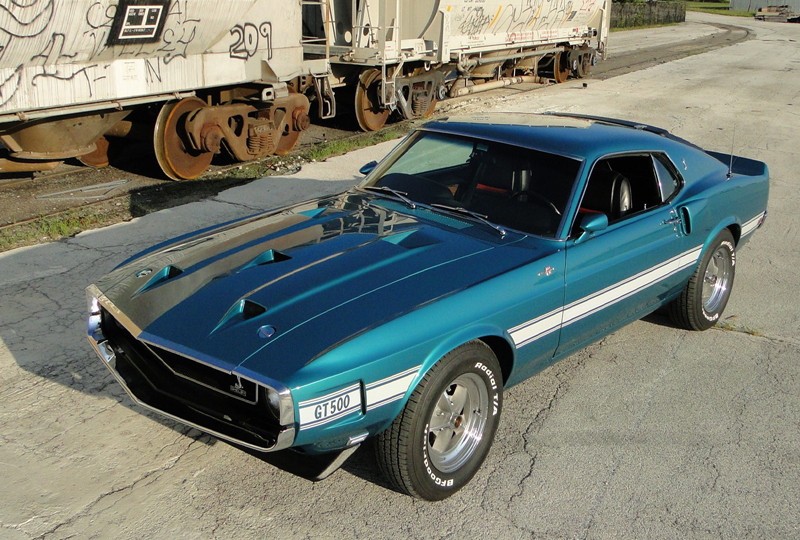 The color for this Shelby is the next step that will set this ride apart from the rest. 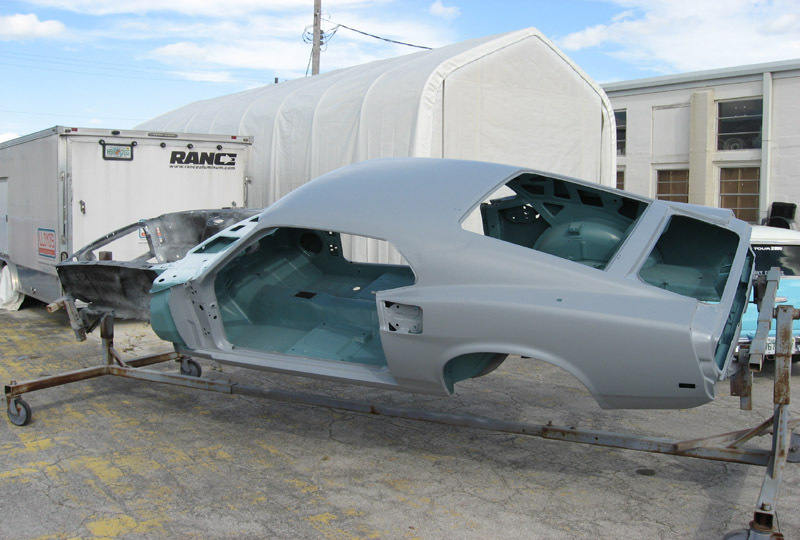 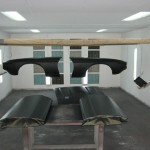 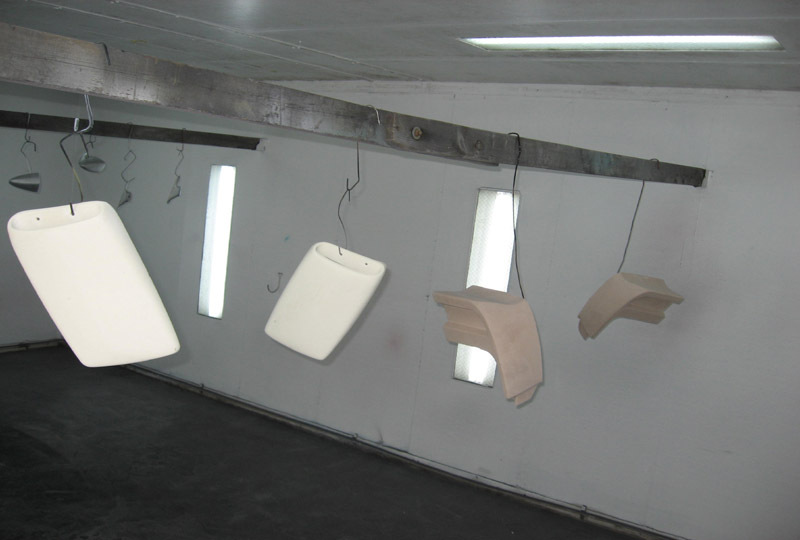 All body panels have received their final sanding and are ready for the color phase. 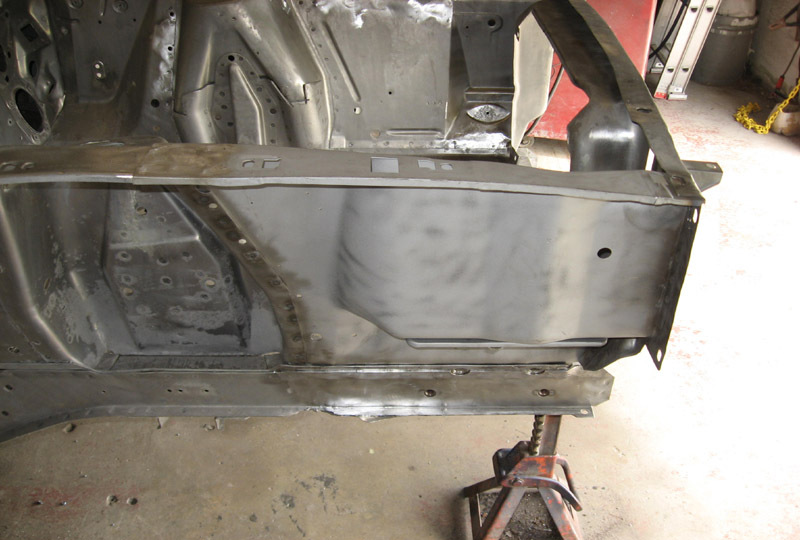 Up next the new finish and reassembly begins. 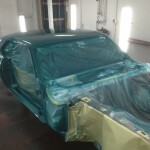 All the color and final clear coats have been applied, the belly overspray effect, rear wheel well under coating and engine compartment blackout is completed also. 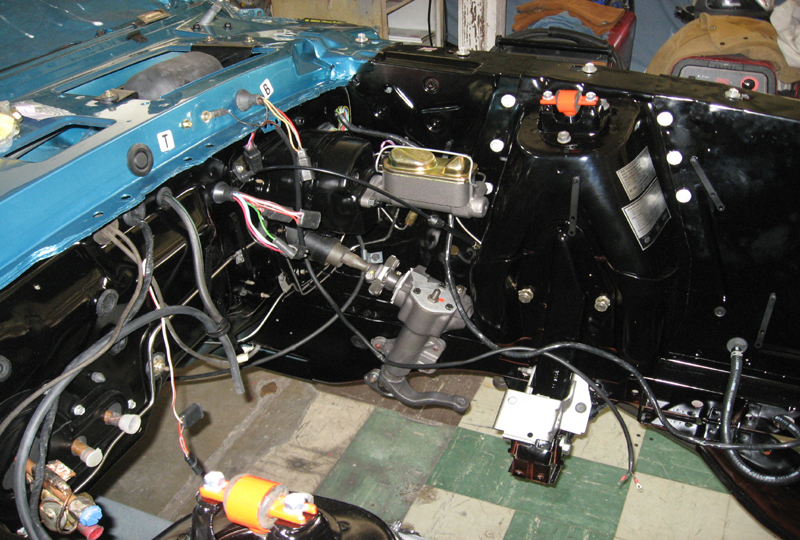 The new fuel and brake lines as well as the lower instrument panel, HVAC system, wiring harnesses and engine compartment essentials have been installed. 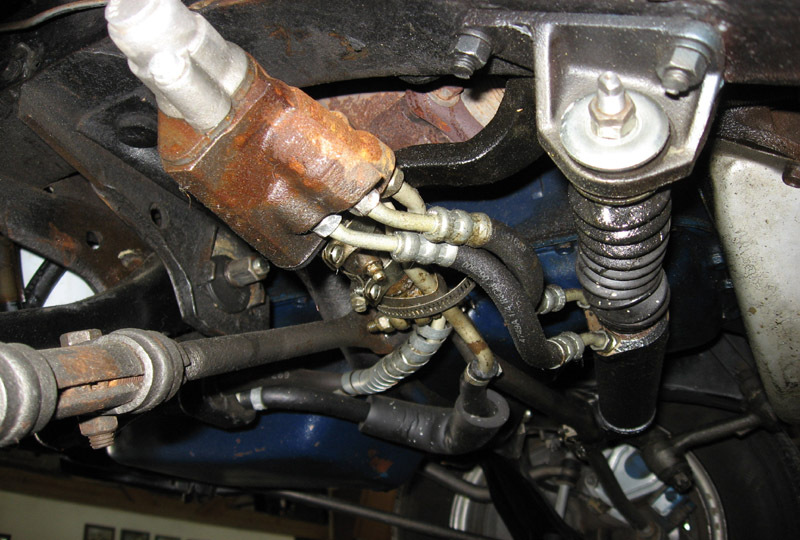 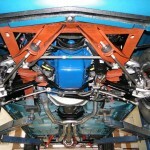 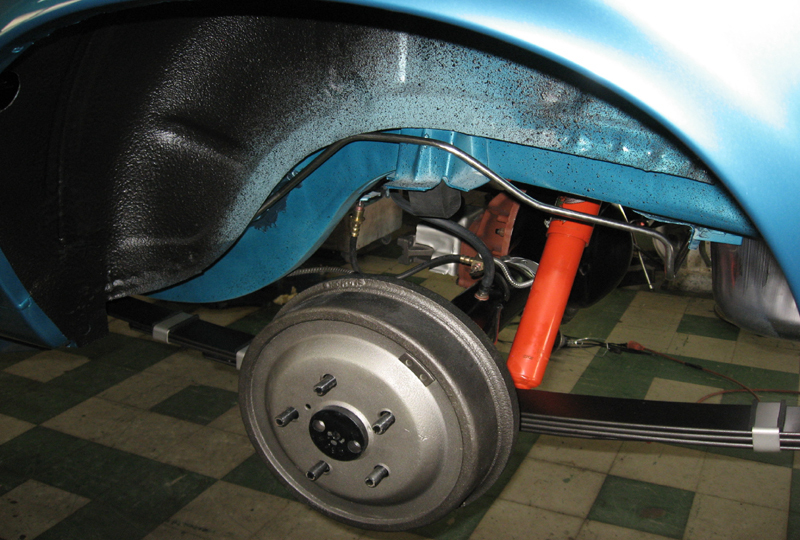 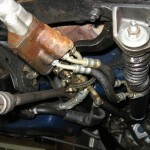 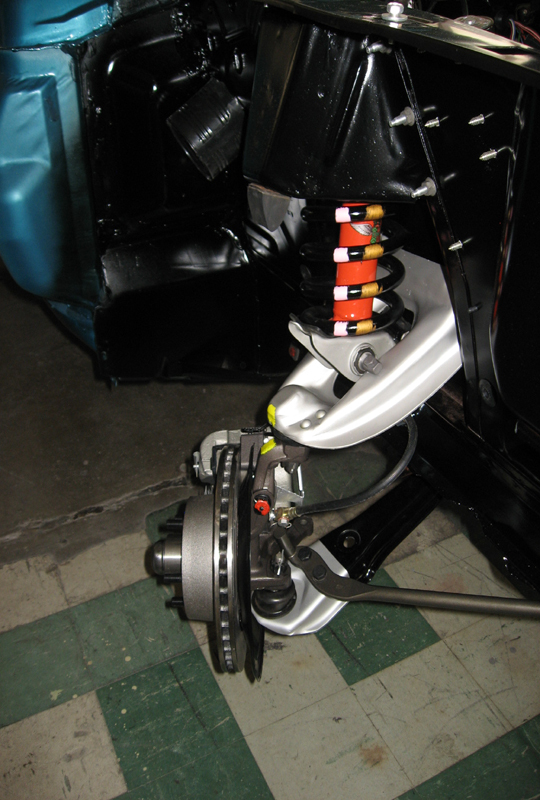 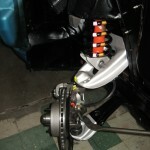 Rear axle, shocks and front suspension, less sway bar and steering linkage are in. 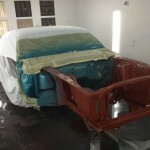 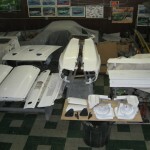 Assembly of the car has been taken as far as it can until the paint color sanding and buffing is completed. 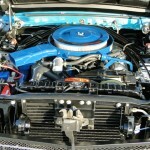 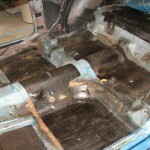 Next is the engine install and removed panels getting their color sanding and buffing. 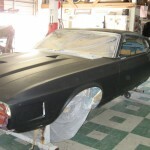 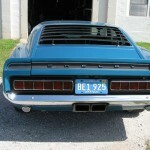 Stay tuned it’s getting closer to a renewed 1969 Shelby! 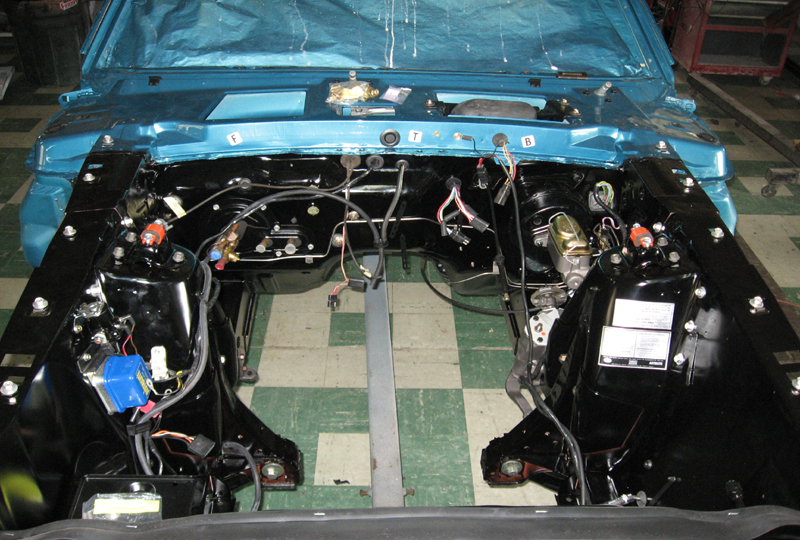 The engine is in, exhaust hooked up and all systems filled with their proper fluids. 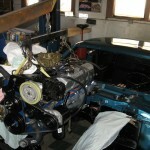 The 428 has come to life and runs beautifully. 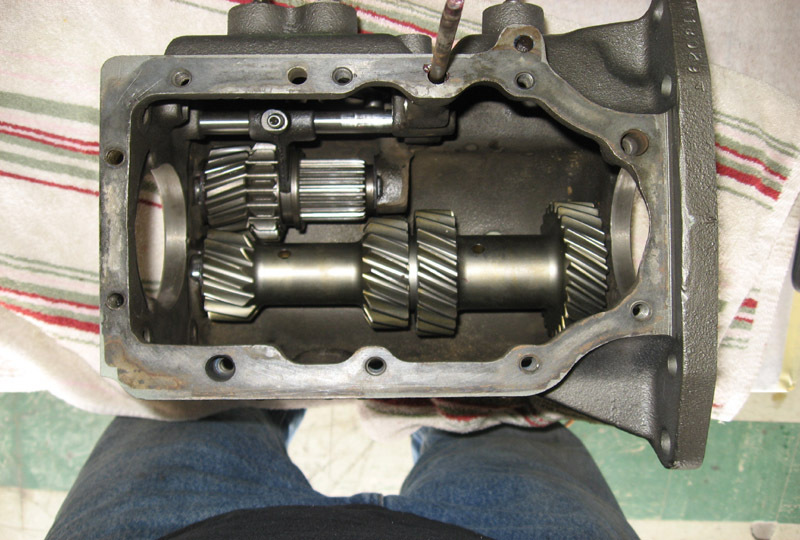 All gears are smooth and running temps acceptable. 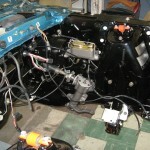 The electrical system checks out with lights and systems doing their tasks. 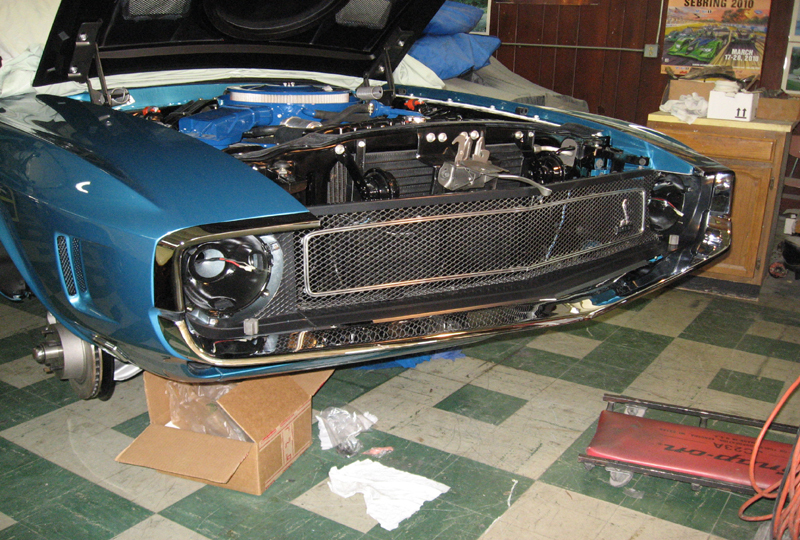 The front end has been assembled, the bumper, lights, a chin spoiler and strips also added. 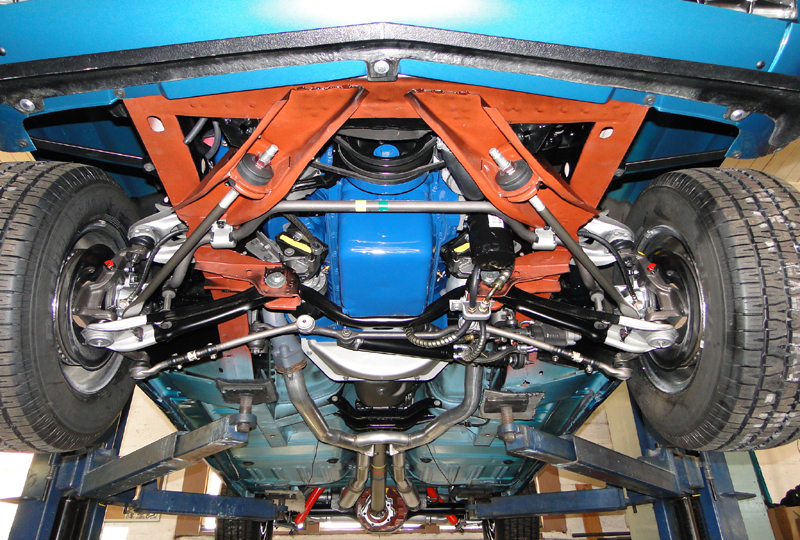 The last items are to charge the AC system, install the wheels and tires, align the front end and to conduct complete and proper road tests. 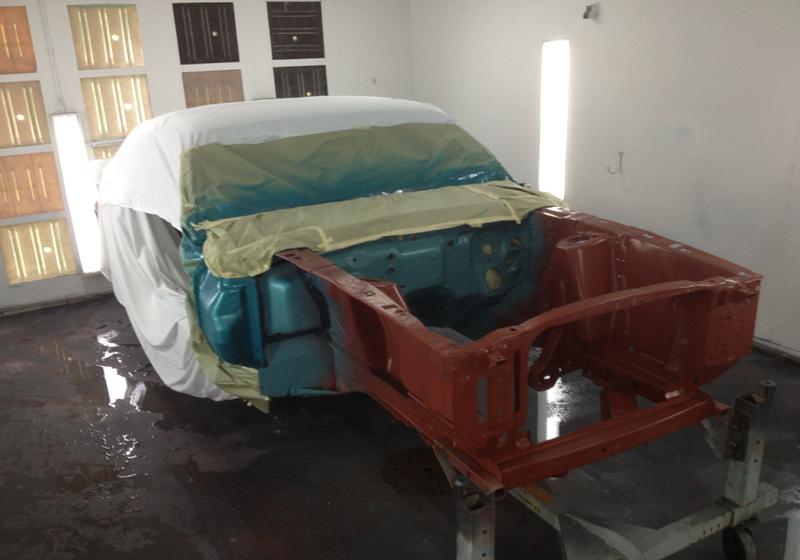 The transformation has been right on schedule and certainly given this special car new life for a great future! 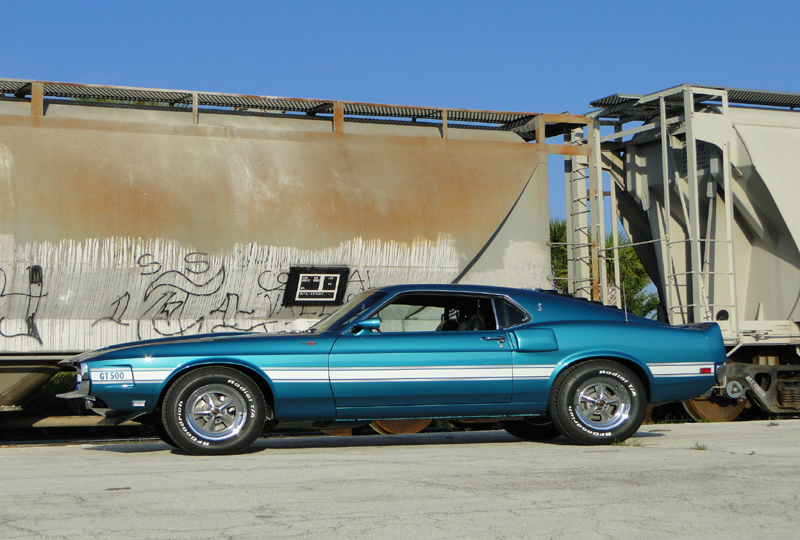 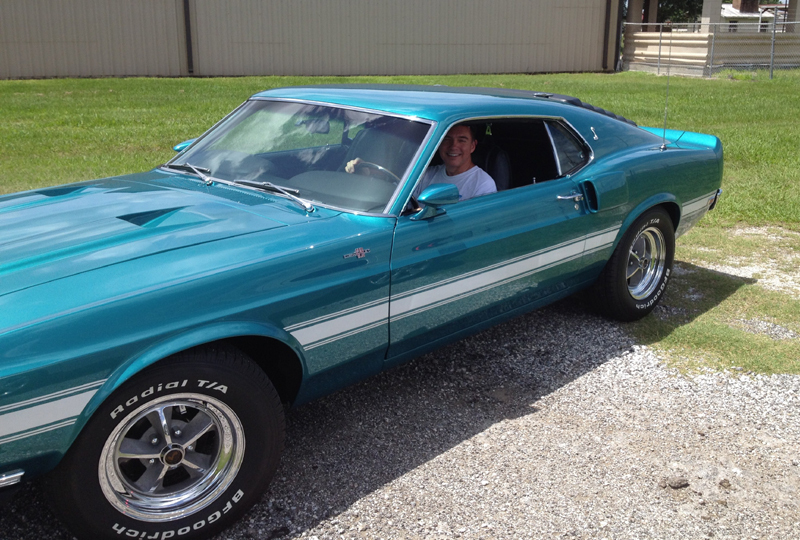 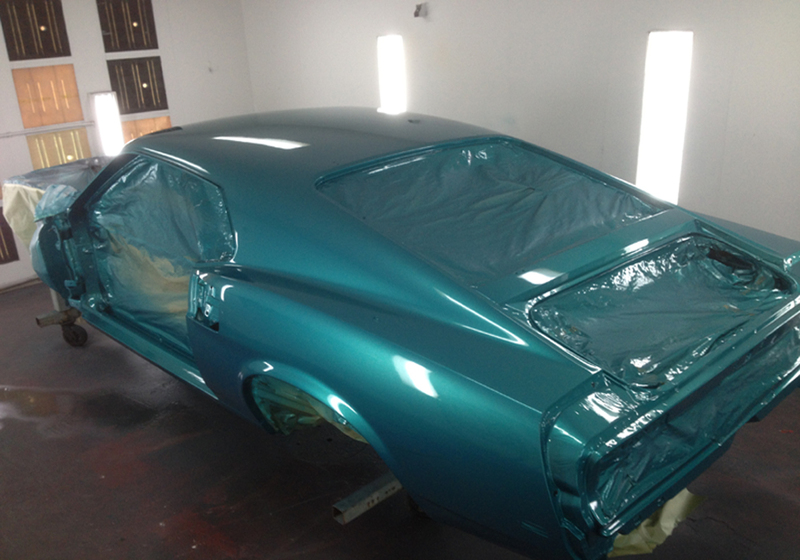 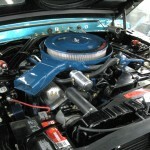 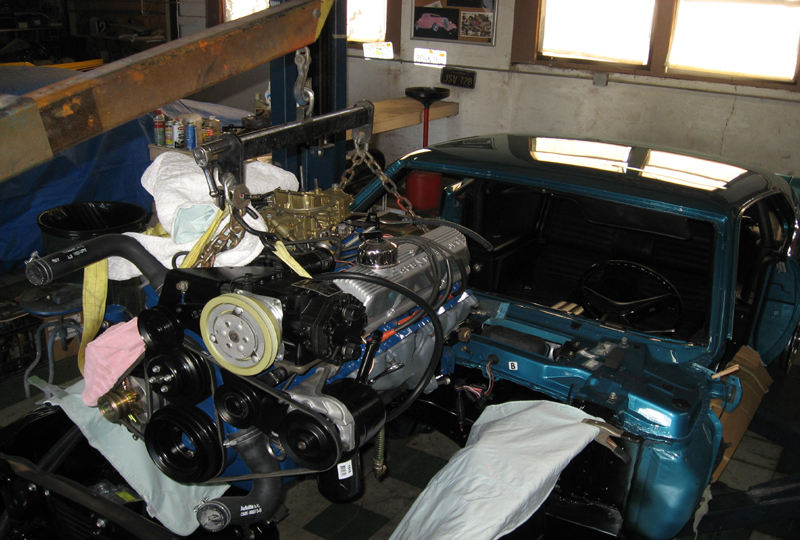 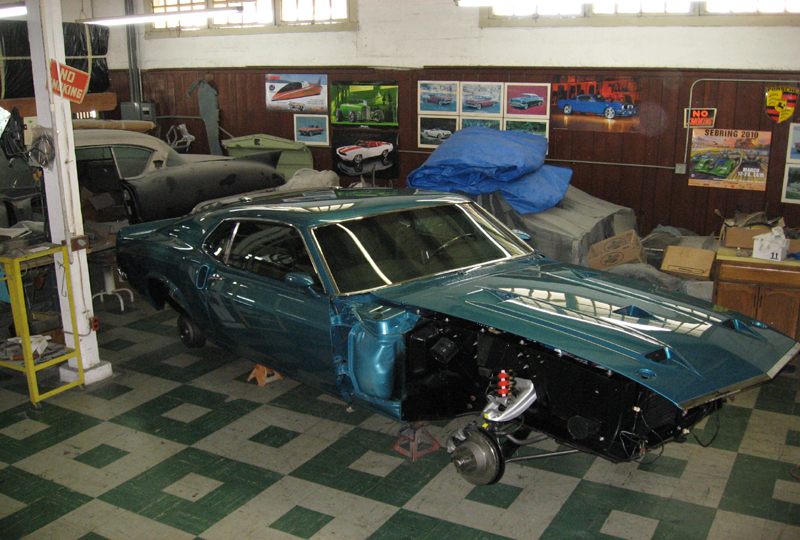 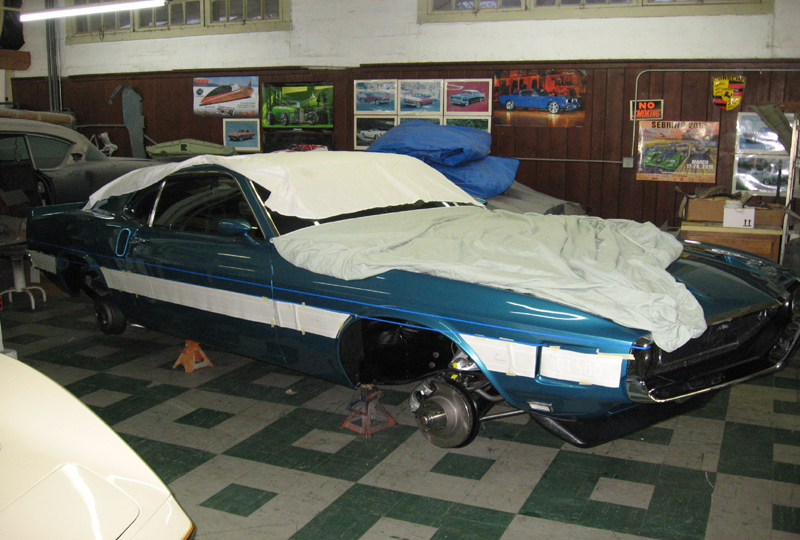 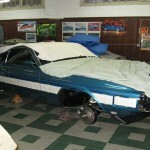 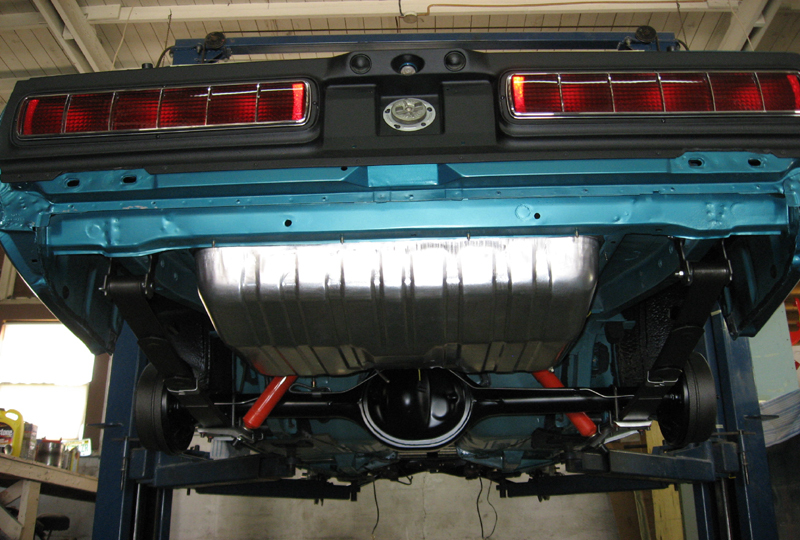 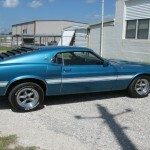 This new 1969 Shelby GT500 is now complete and back at its home stable. 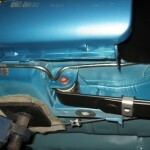 We drove the car to sort out any possible drivability issues and came up with a few. 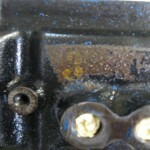 Each was corrected and the car drove home approximately 50 miles running strong! 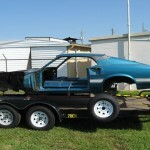 Now its new life can be enjoyed for years to come.